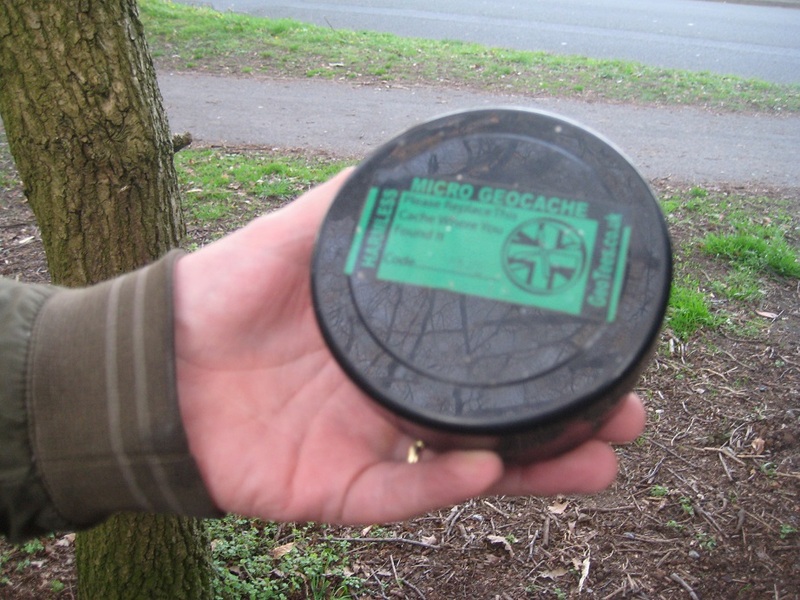 When did we last attend a geocacher’s meet? We thought about it, and it had been a while, years, Leap Year Day 2016. 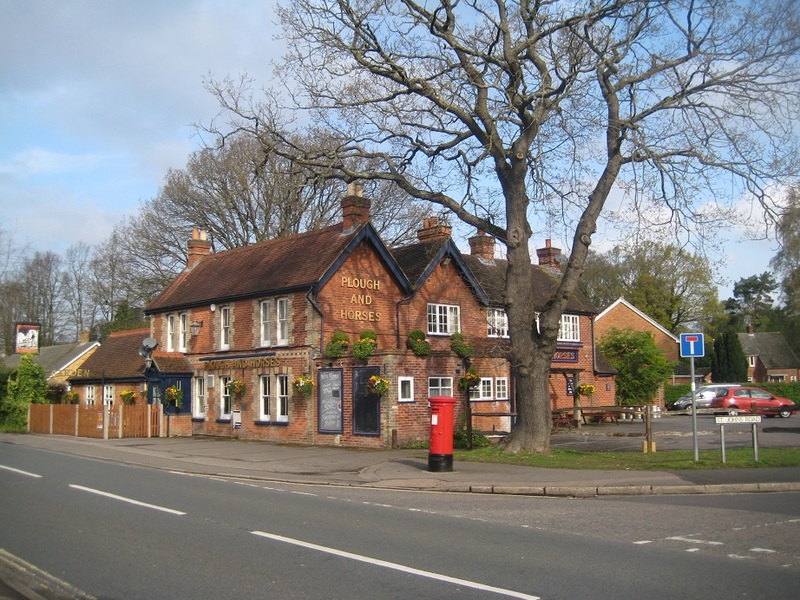 We’d noticed that there was a meet coming to a place near us, the Plough and Horses at Cove, Farnborough. A little bit of research showed us that there were two Church Micro multicaches very close to the pub. 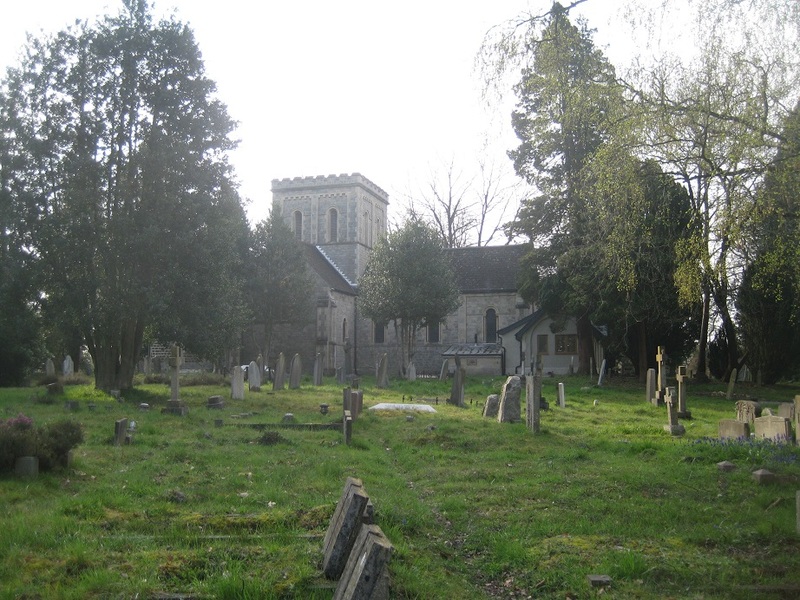 As we didn’t fancy an extended search of a graveyard later on, in failing light, and so we didn’t get lost, searching fruitlessly in the dark, we also did a daytime recce of the area, spotted the pub, and collected all the information we needed to find the caches later. Early in the evening, we returned to Cove, and stopped a little way short of the pub, to look for the Church Micro based on St. John the Baptist. 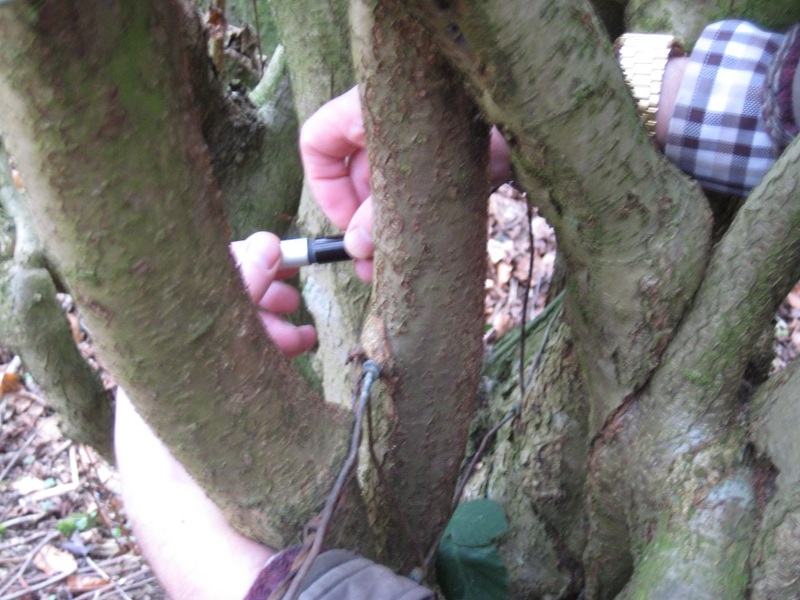 We parked near a parade of shops, then walked off a little way to wait for a gap in the dog walkers and joggers to dive, hopefully unsuspiciously, behind a tree to find the cache: our research was correct. A good evening – pleasant company – great stories. 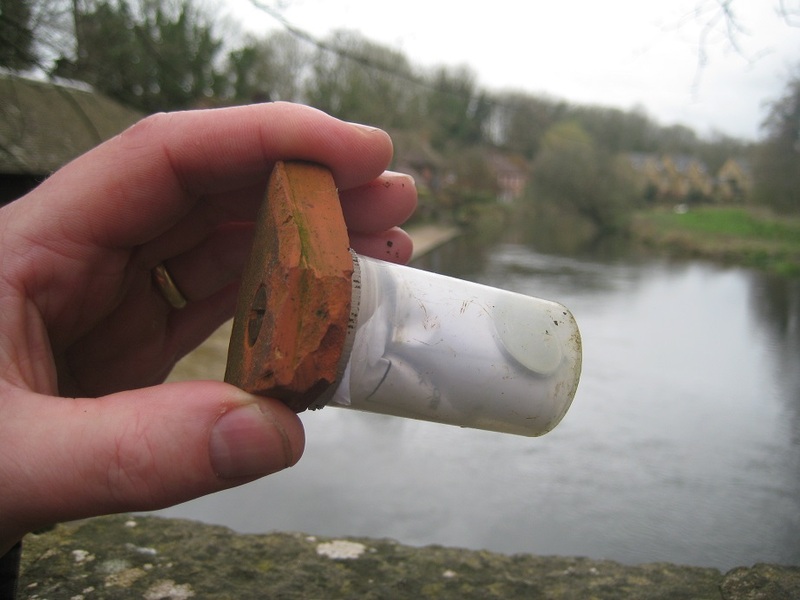 Here are two Church Micro caches, against bland backgrounds, for anonymity. 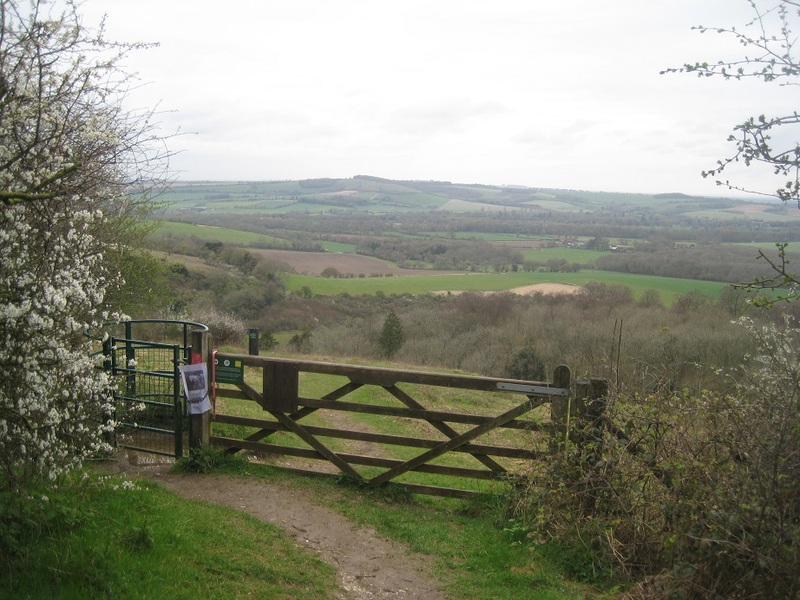 The next section of our South Downs Way walk would take us from Exton to a small off-road car parking space just a little distance from the top of Butser Hill (part of the Queen Elizabeth Country Park estate). 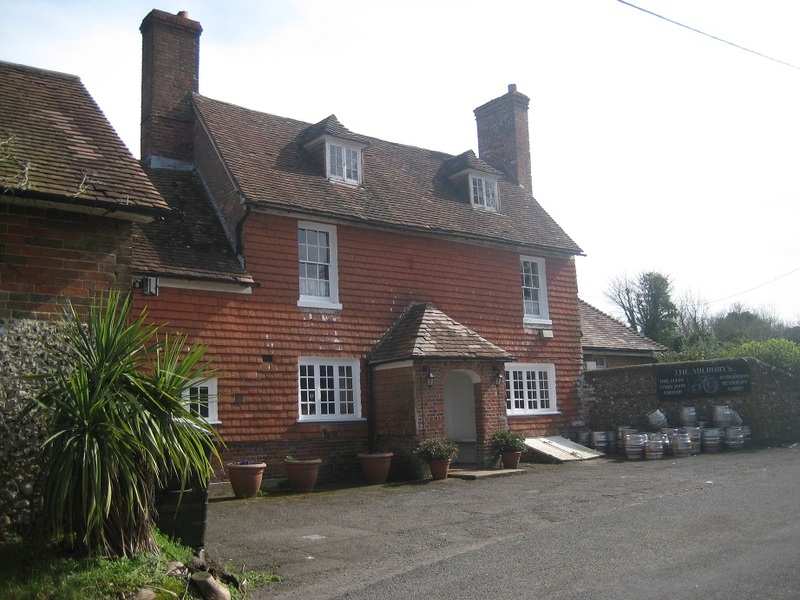 The route would take us away from Exton, briefly following the River Meon, and then climbing and contouring around Old Winchester Hill, descending to cross the River Meon before ascending once more towards Butser Hill. 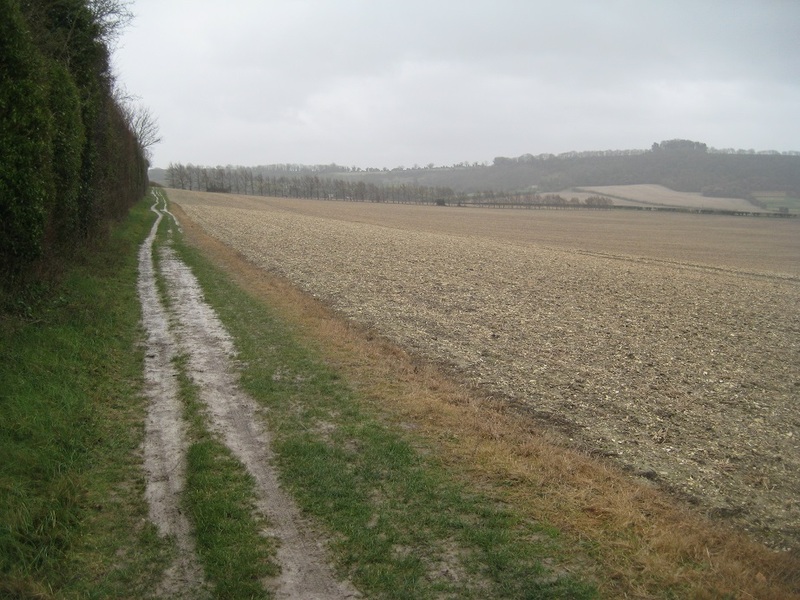 When we walked the South Downs Way (SDW) seven years ago, today’s section was one of those which enthralled us least. Today though was different. 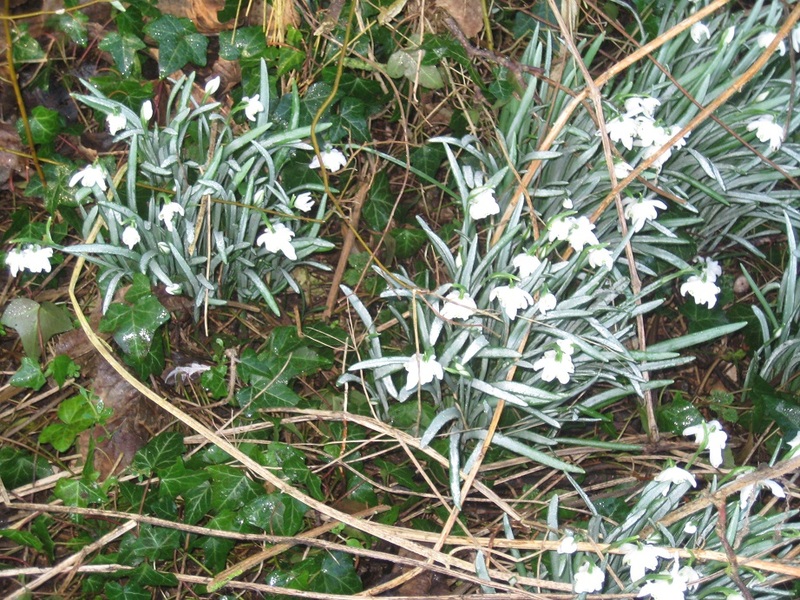 Early spring, verdant green colours abounded. Birds sang from the tree tops. The slightly-hazy views were far reaching. 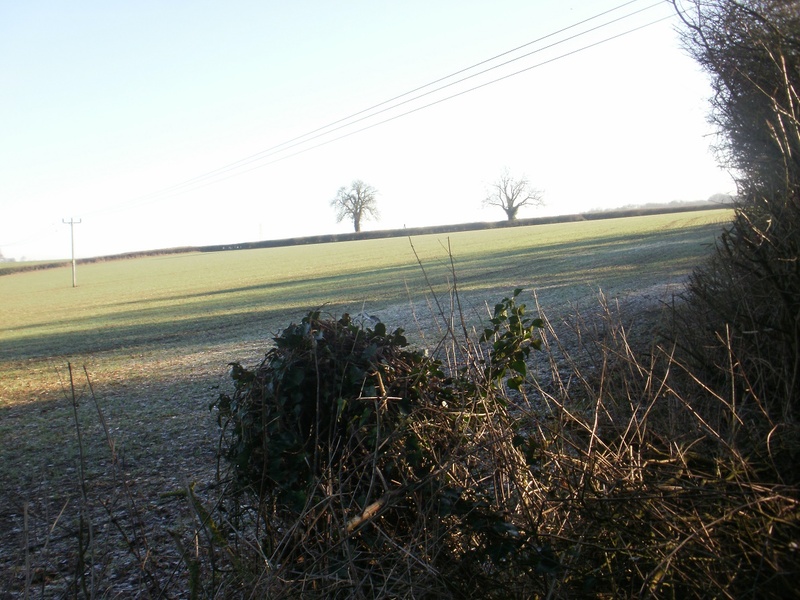 And what we both remembered as a traveller’s caravan site had disappeared revealing farmer’s fields. No caches in this tree! 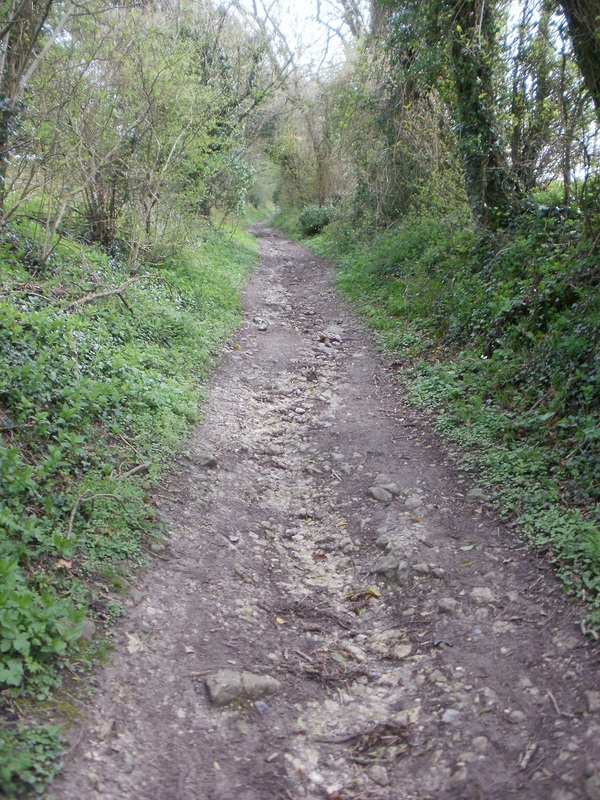 The path out of Exton is quite tricky terrain. 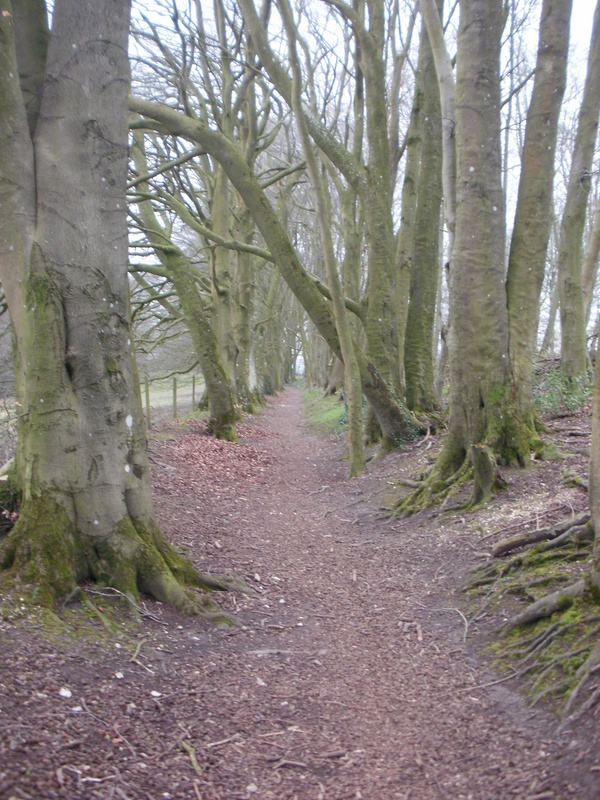 Following recent rain, the path was slightly muddy, narrow and covered with tree roots. 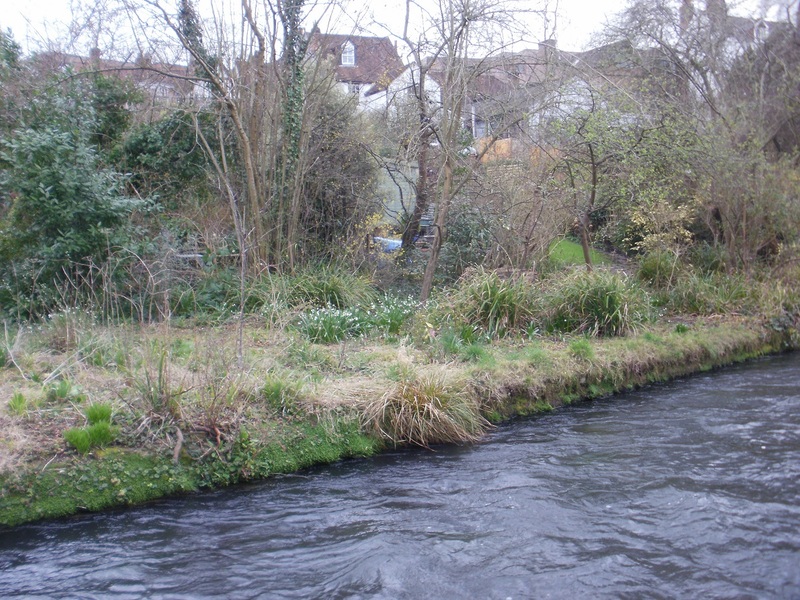 We picked our way carefully, aware that the River Meon was only feet away. 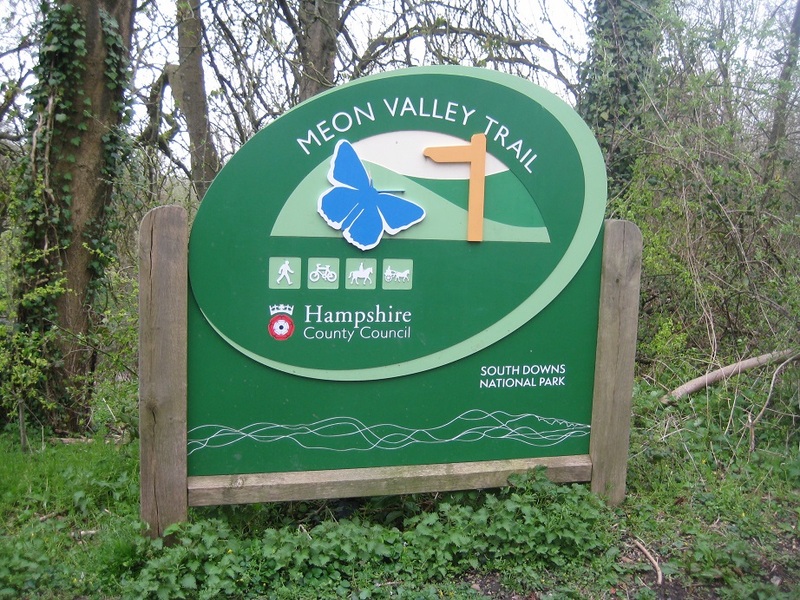 We were slowly climbing, and eventually reached the Meon Valley Cycle Trail. As we did so, we heard voices behind us, and two gentleman were approaching quite quickly. They too, were walking the South Downs Way, and also paused at the Cycle Way. 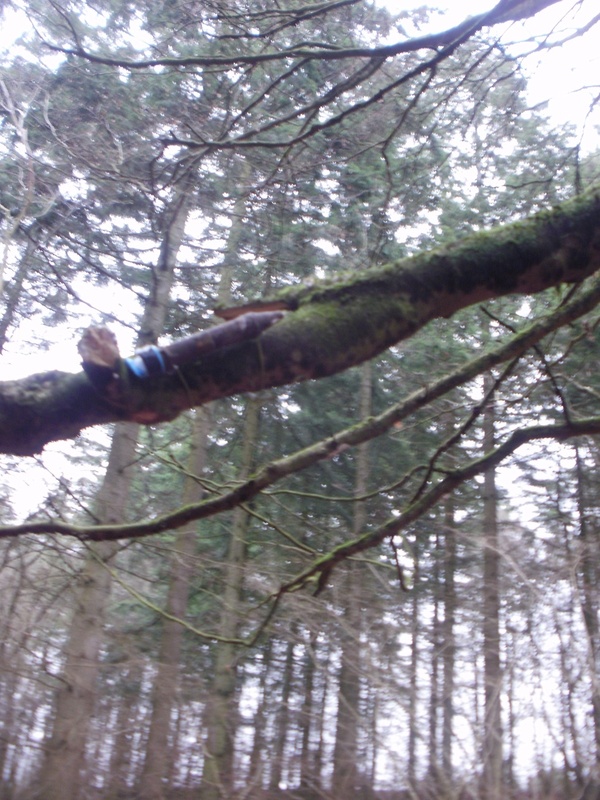 This was a slight problem as there was (or at least could have been) a cache for us to find. 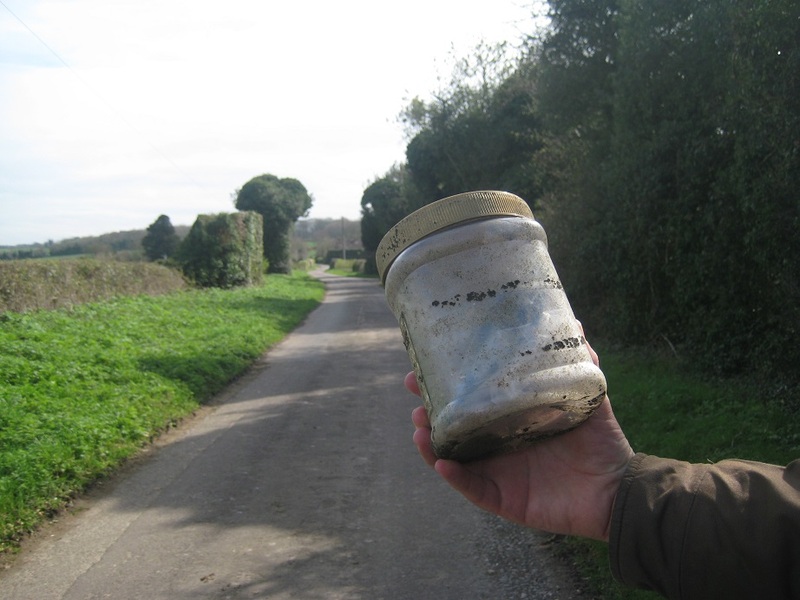 The cache had had many DNF’s as well as being temporarily archived. We thought it would be good to give a quick search anyway. 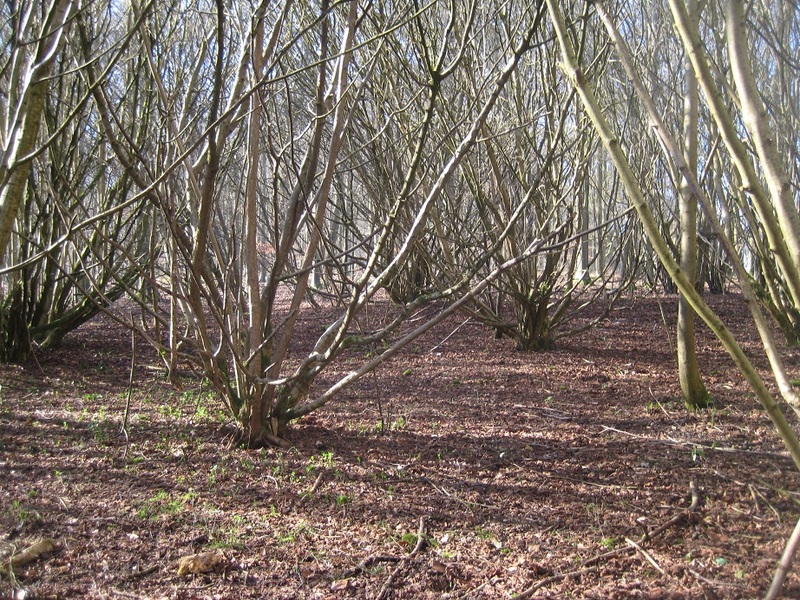 After the two men disappeared, we undertook our search – but, of course, to no avail. 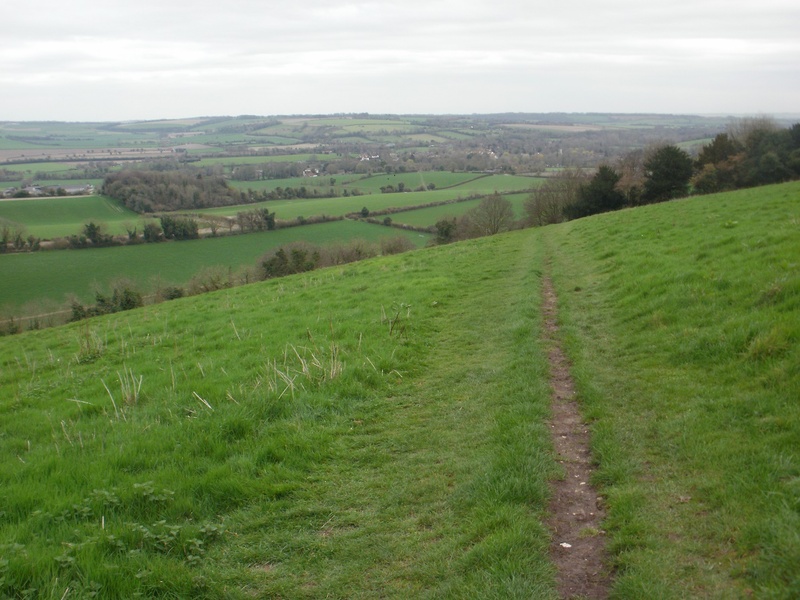 The next section of our walk involved the steep climb up Old Winchester Hill. 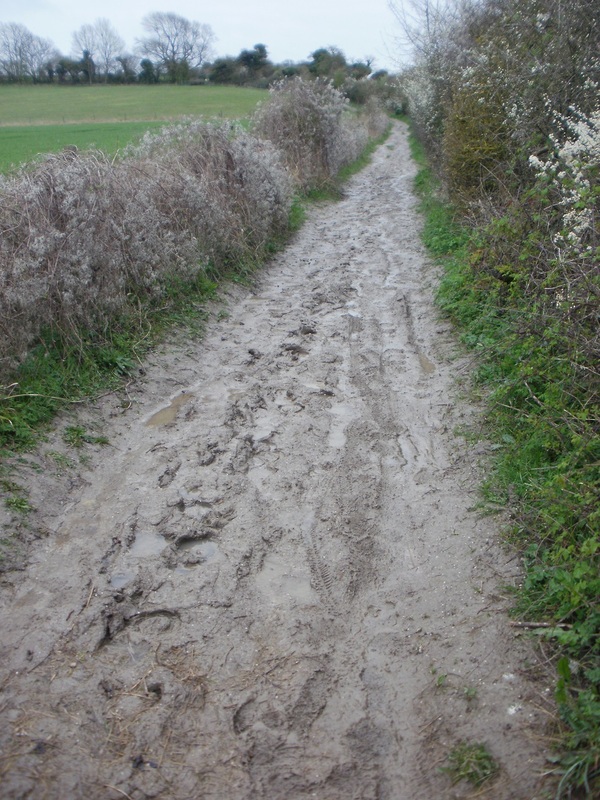 Like our preceding visit, 7 years previously, the path was wet following the recent rain, and being chalk was very, very slippery. It was a case of two steps forward and one slither back ! About two thirds up the hill, the South Downs Way contours away the top, and the highest point of the hill is not visited. 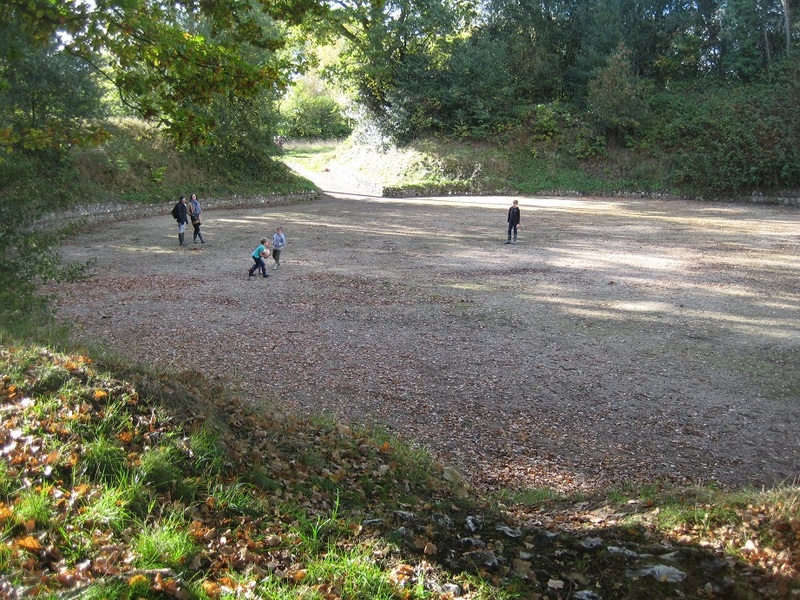 (Editor’s note : probably because the hill is Iron Age Fort and Bronze Age Cemetery). As we contoured round we passed a field full of sheep and new lambs. 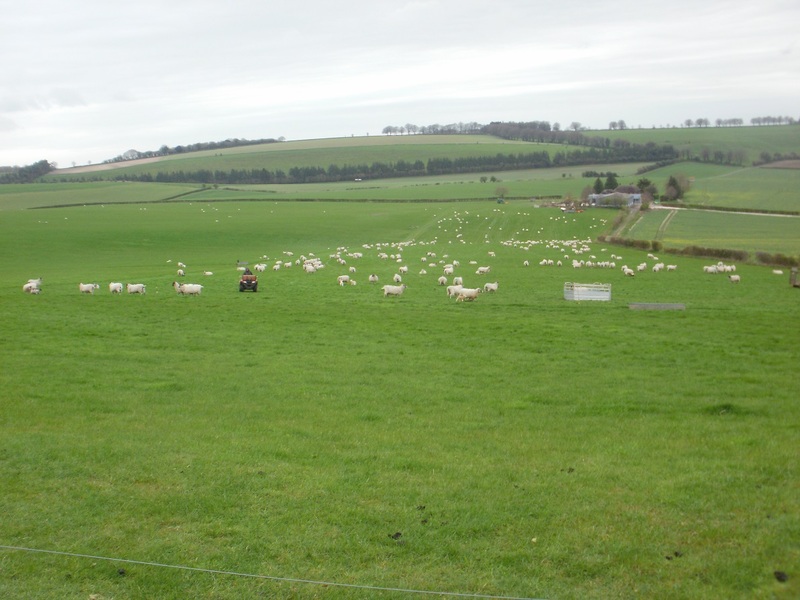 A farmer on a quad-bike was zooming around the field, subconsciously checking the sheep, but not going close to any of them. We wondered how he was going to leave the field, as we was roaring at speed to the footpath near us. As he approached the wire fence, he stuck leg out, pushed the wire down with his foot, and drove straight over. 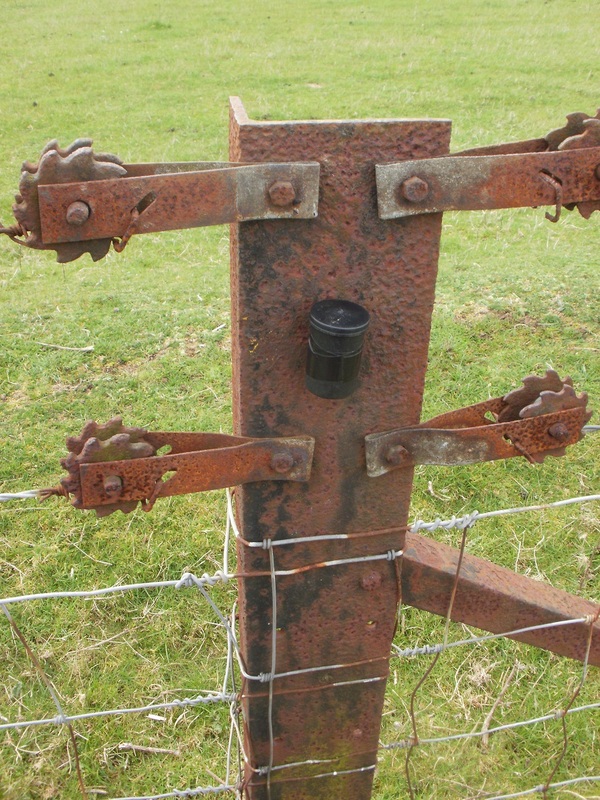 Clearly its not always walkers that damage wire fences! We proceeded onwards and arrived at a seat. Sadly for us, the two men we had seen earlier were there, having a brief stop. We cast our eyes further and saw another bench about 100 yards away…we went to this bench and paused ourselves for coffee. 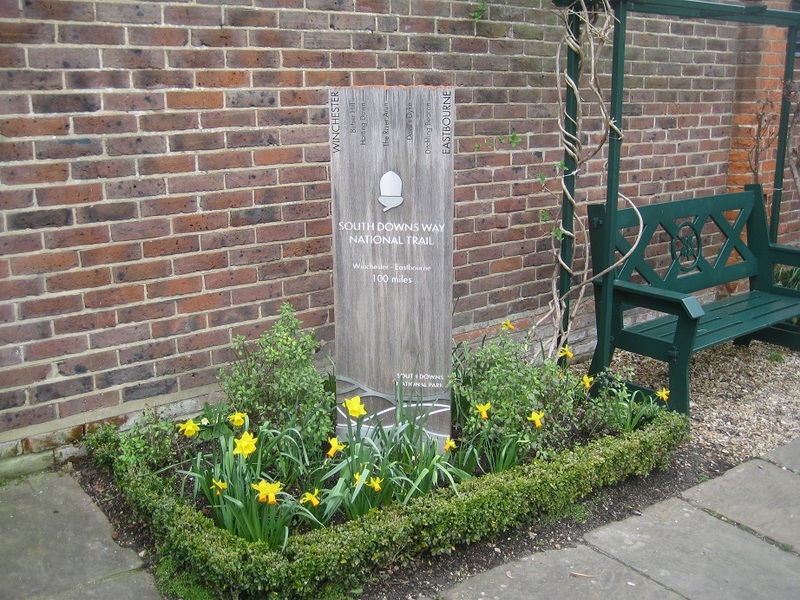 It was fortunate we were ‘forced’ to use this bench as it was a cache host! We’d walked close on 2 miles and this was our first cache of the day! 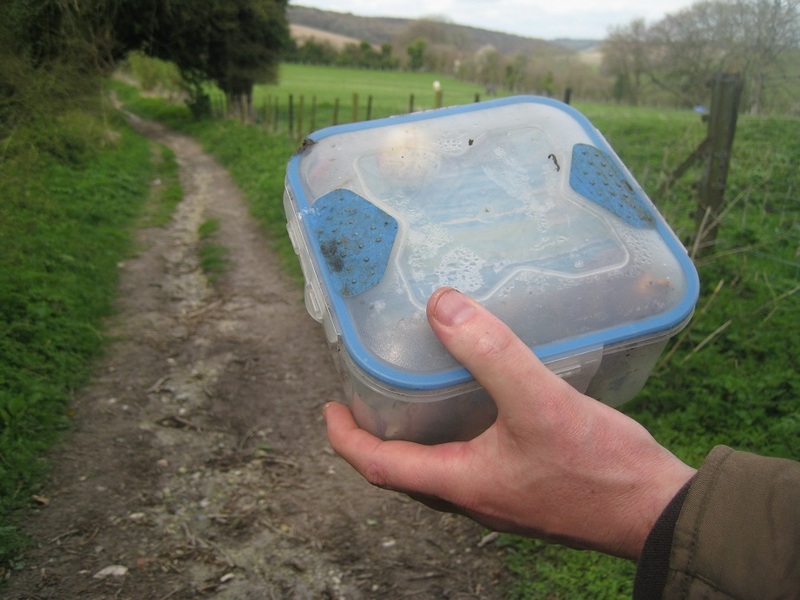 The cache was called ‘Life of Bryan’ and we were expecting to find a snail cache. (We knew ‘Bryan’ was a mis-spelling, but we’ve seen worse). 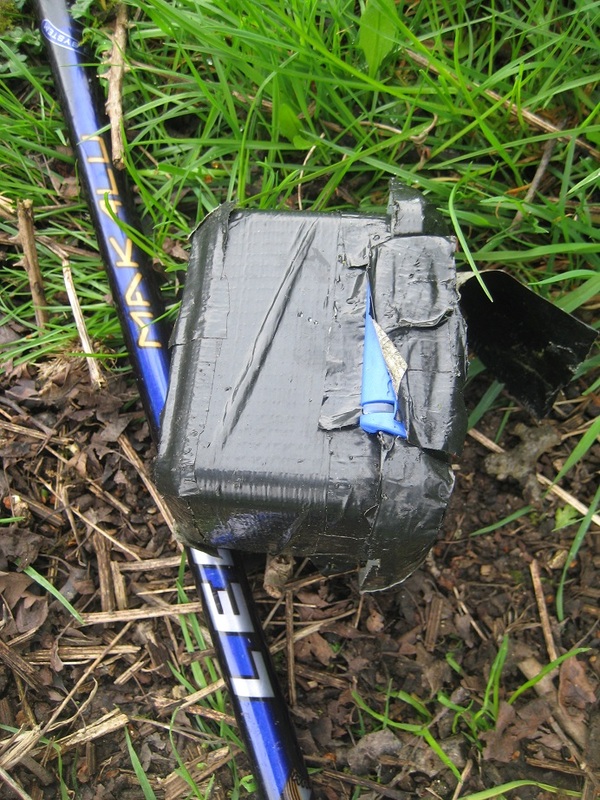 But no, it was a cleverly attached cache. 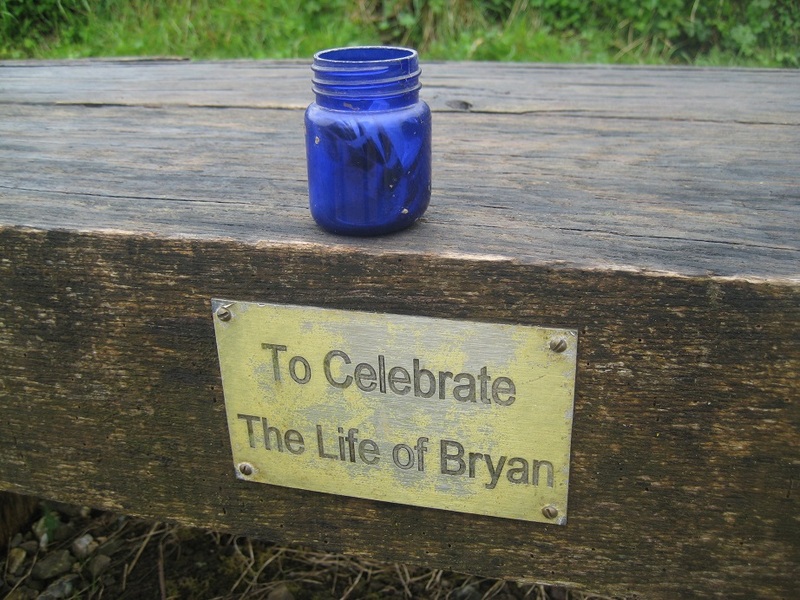 The reference to ‘Bryan’ was the bench marked the life, and passing, of Bryan. Having found our first cache we had several more to find in the next mile and a half. Is there a cache nearby ? The first a multi which we had researched before we left. We had read the logs and discovered that if we had solved it on the walk we would have had a half-mile back-tracking to reach the final. However the cache owner had just given enough away in the cache description we could google our way to the two answers. So we arrived at GZ hopeful our internet research was correct, and when the cache hint matched our locale all we had to do was search! 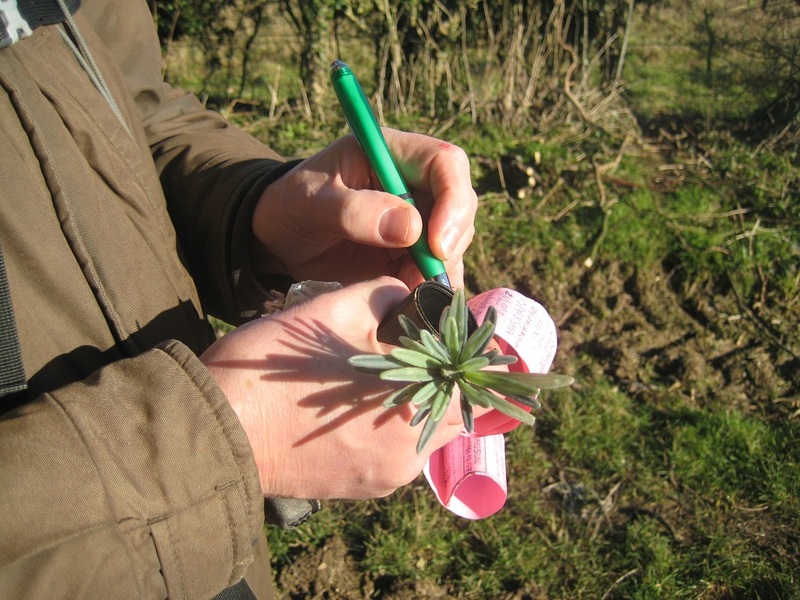 We found it after a couple of minutes – quite pleased we had saved ourselves a half-mile walk! 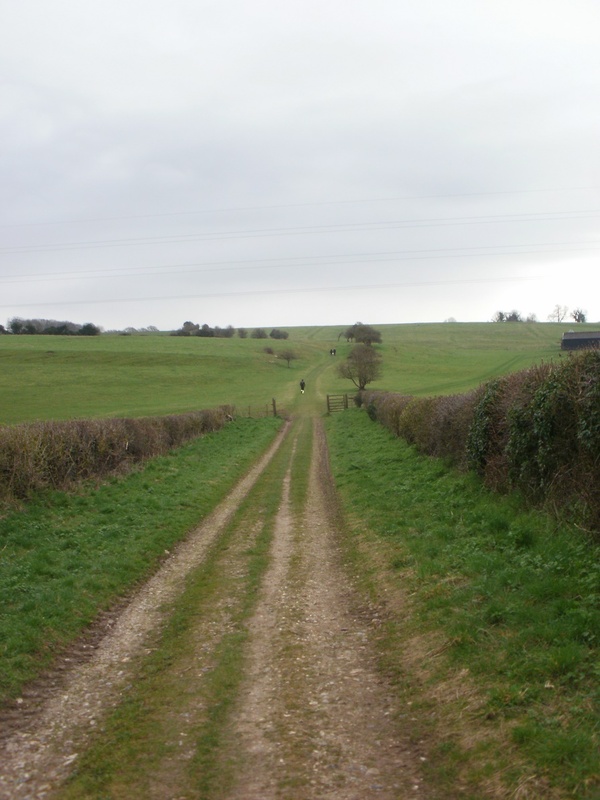 As we left the Old Winchester Hill, the South Downs Way takes a large V shape to avoid a steep descent. We walked along a road, passing an enterprising man selling coffee from a van (Mon-Fri 10-3), before we had a more simple descent towards a farm by the River Meon. Halfway down we found another cache, and at the farm too our fourth find of the day was our simplest. 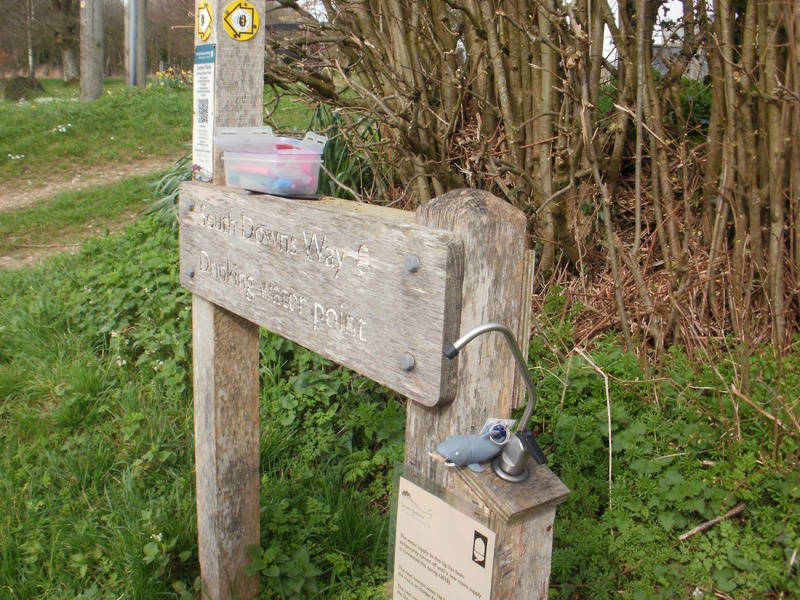 As we crossed the River Meon, we espied some picnic tables, close to the Meon Springs Fishing Club. We chose a table furthest away from the club, as the club sold food, and we had our own. 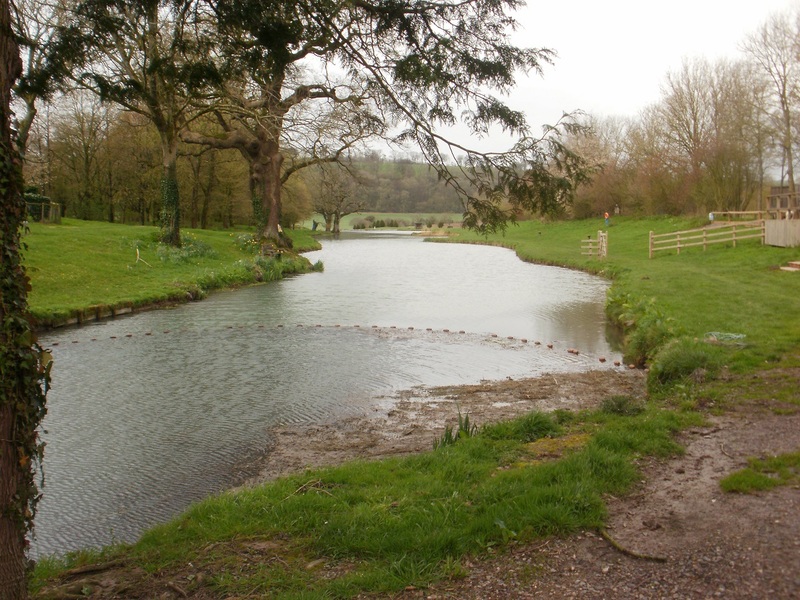 The Fishing Club, is part of the Meon Springs Experience. You can glamp in yurts or shepherds huts. You can clay pigeon shoot as well as fish. The South Downs are available to explore. There’s even self-storage units too ! A good little sideline for the farmer whose land the various activities are held on! 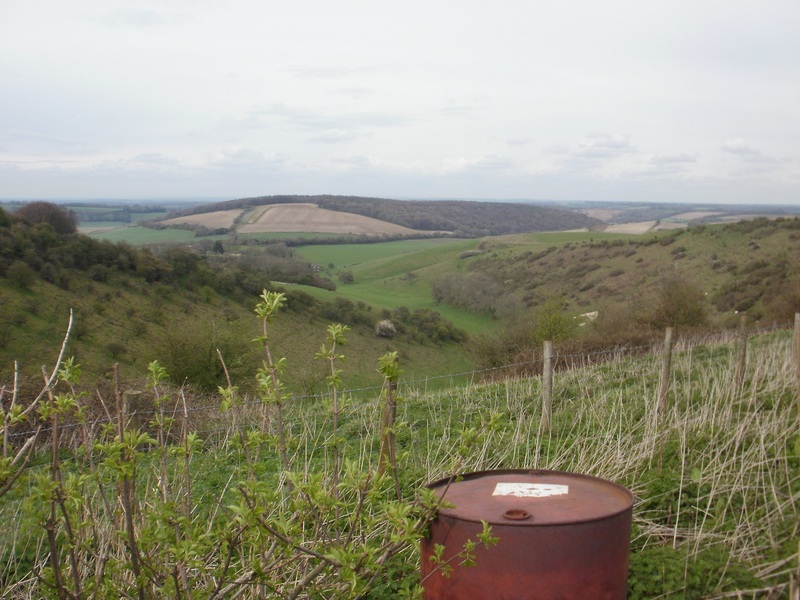 We saw the yurts from afar, as replete from lunch we slowly climbed out of the Meon Valley. 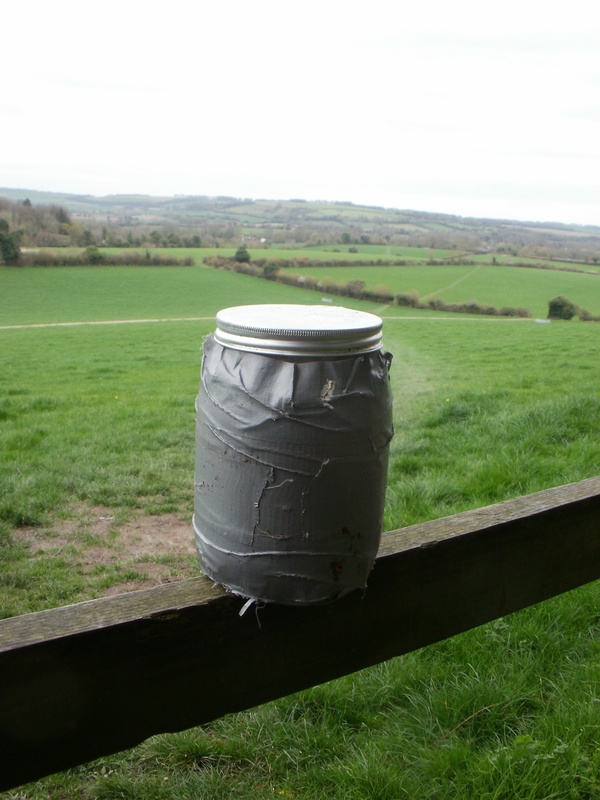 Three caches broke our climb, one placed by the South Downs Authority, another was cracked, and broken it was full of water. 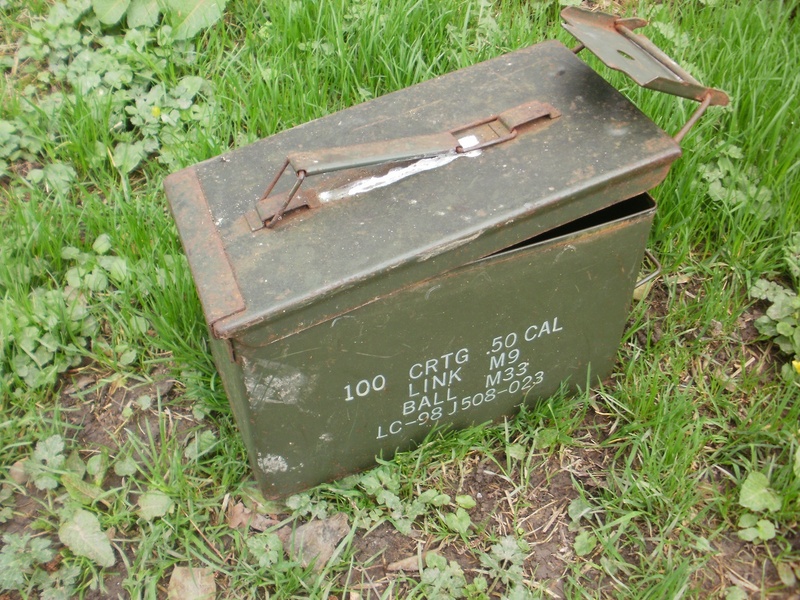 The other, an ammo can, placed way back in 2006 by Esscafe. 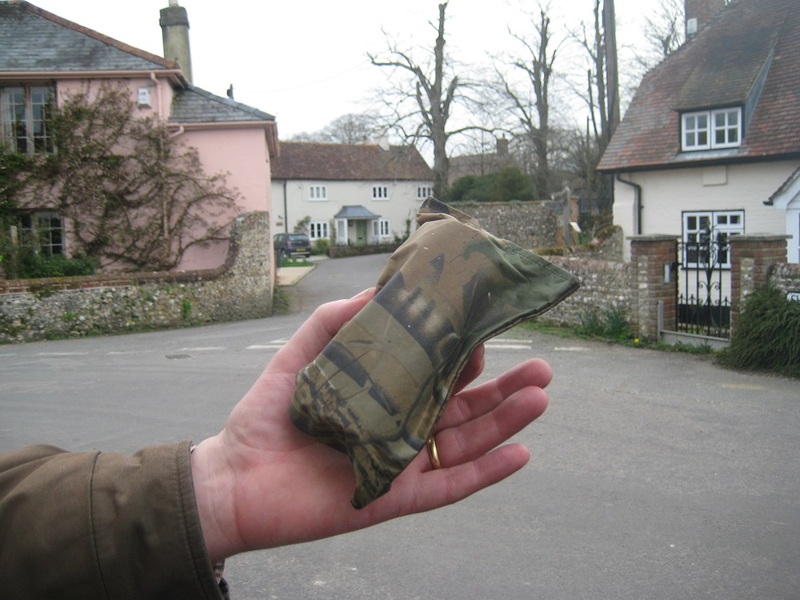 We met Esscafe at cacher’s meet in Imber shortly after we started geocaching. 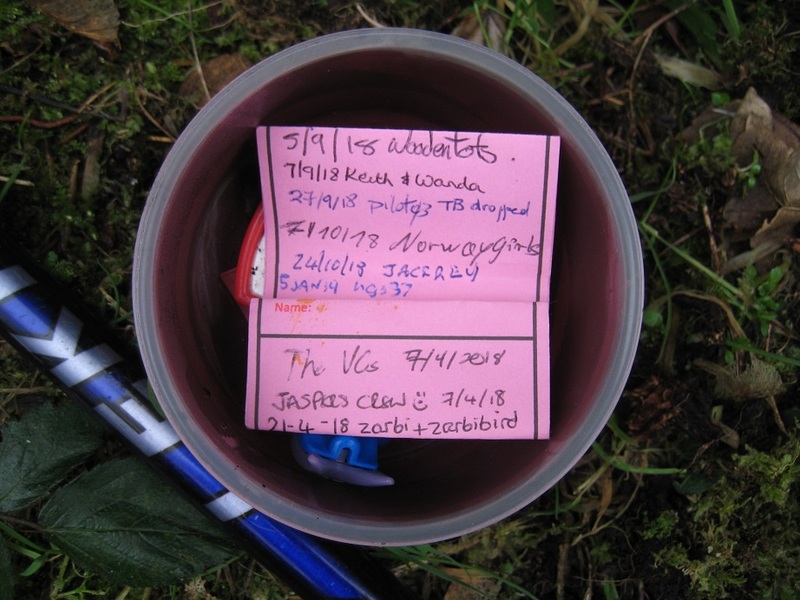 She was a prolific geocacher (the cacher with the most finds the UK at the time of her untimely early passing a few years ago). The effort climbing away from the River Meon was worth it, a slightly hazy, but recognisable view of the Solent and the Isle of Wight were visible. Towards the top of our climb, near a pair of transmission towers, were two more caches. 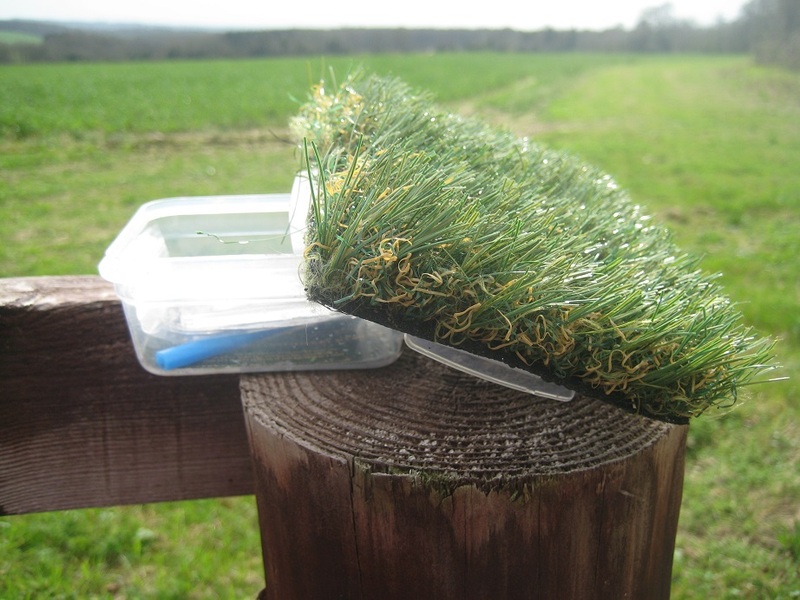 One was magnetic and stuck to a gatepost, the other well camouflaged as something unsavoury! 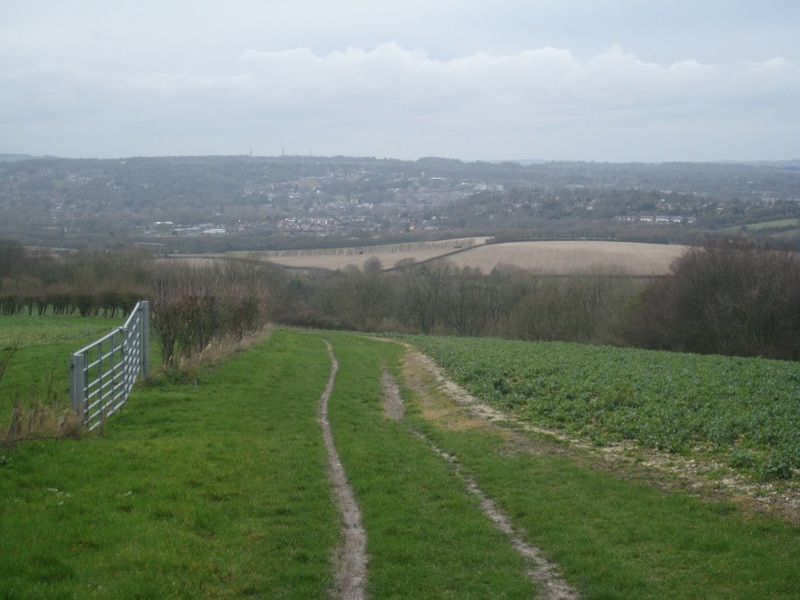 The remainder of our walk, was broadly flat, with views over the Meon Valley to the North. We passed the Sustainability Centre, which promotes greener living with various courses and wildlife sessions. 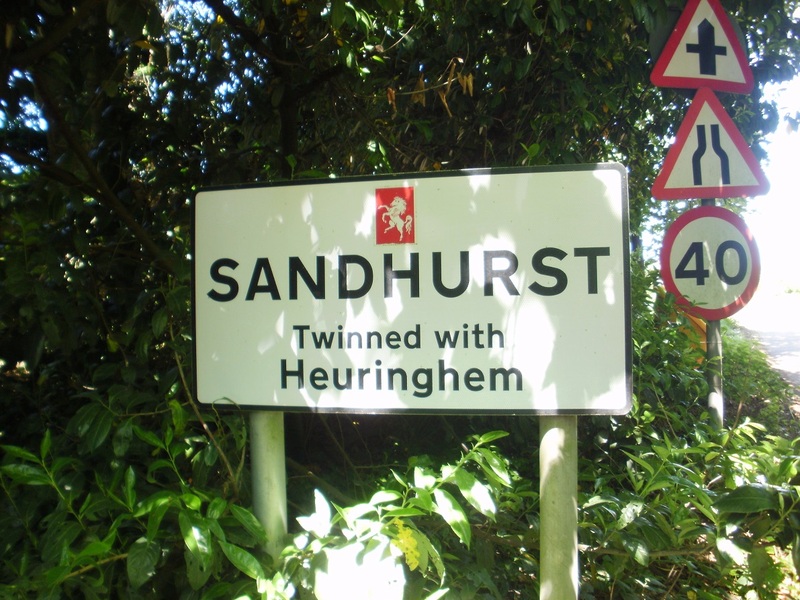 And then a major landmark on our 100 mile South Downs Walk. The 20 mile marker! Placed again by the South Downs Authority, this was the cleverest hide of the day and worthy of the favourite point we gave it. 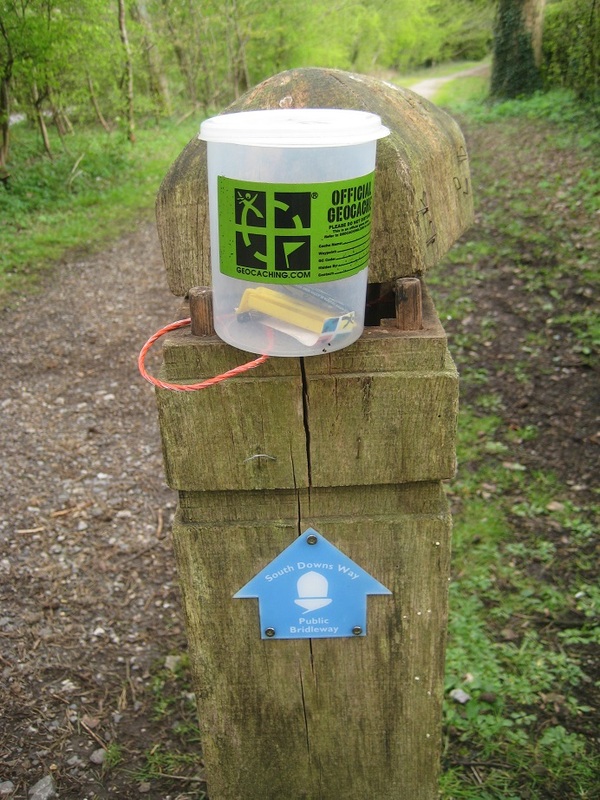 Three of our last four caches were part of mini-trail called SOUTHDOWNS MEON VIEW 1, 2 and 3. 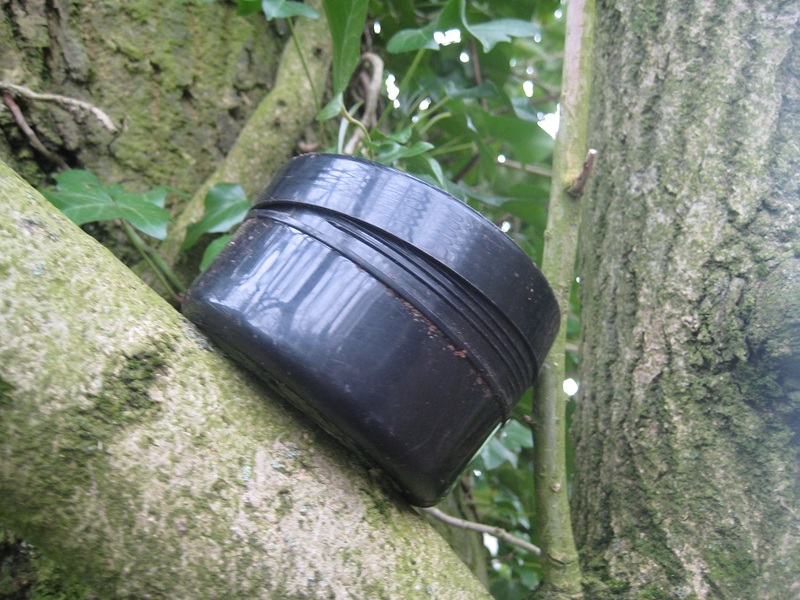 These varied in difficulty from a barely hidden container, to a film canister squashed into a tree crack. The cache that gave us most difficulty was a bison. 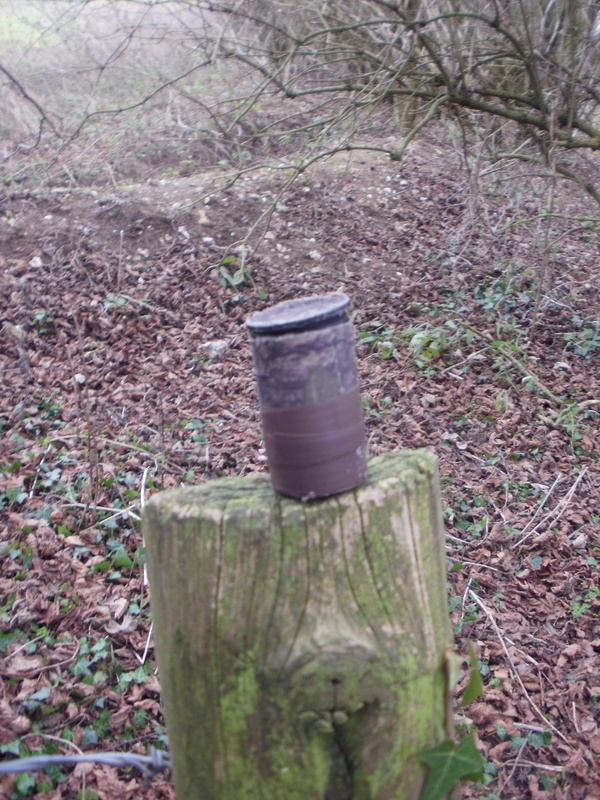 There were two main reasons for our problems at this cache; firstly we were expecting a film canister, secondly a family of three and two dogs parked right next to us as were searching and we had to wait some minutes for them to move on. 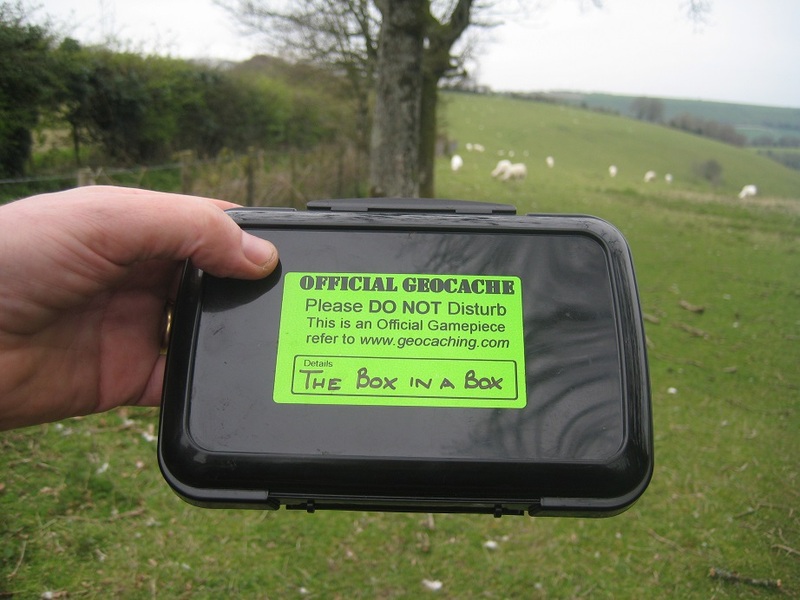 Our last cache, ‘The Box in a Box’ had recently been checked out by the cache owner, and the two boxes were pristine. So in the end we found well over a dozen caches. Most yielded a great view, over the very scenic Meon Valley. 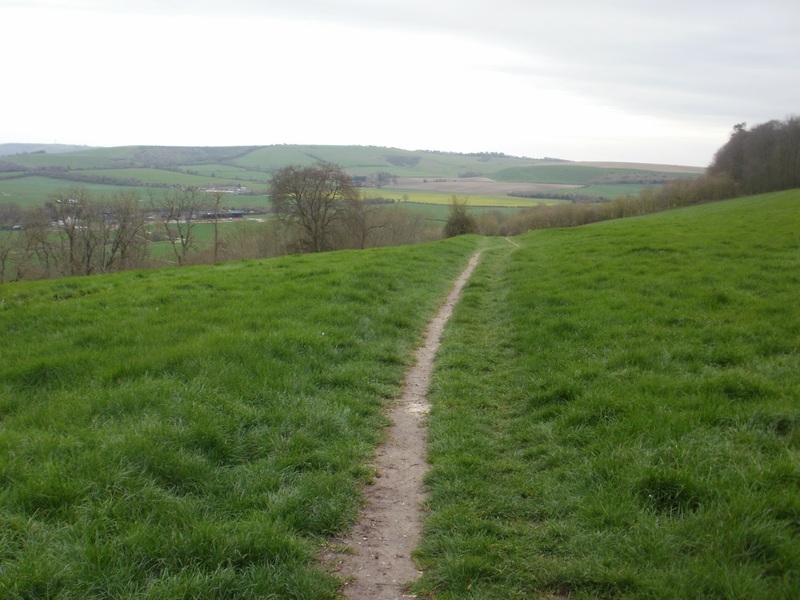 On a cool grey Saturday morning, we set off to walk our second leg of the South Downs Way (SDW), starting high on the downs at Cheesefoot Head, near Winchester, and finishing at Exton in the valley of the River Meon. 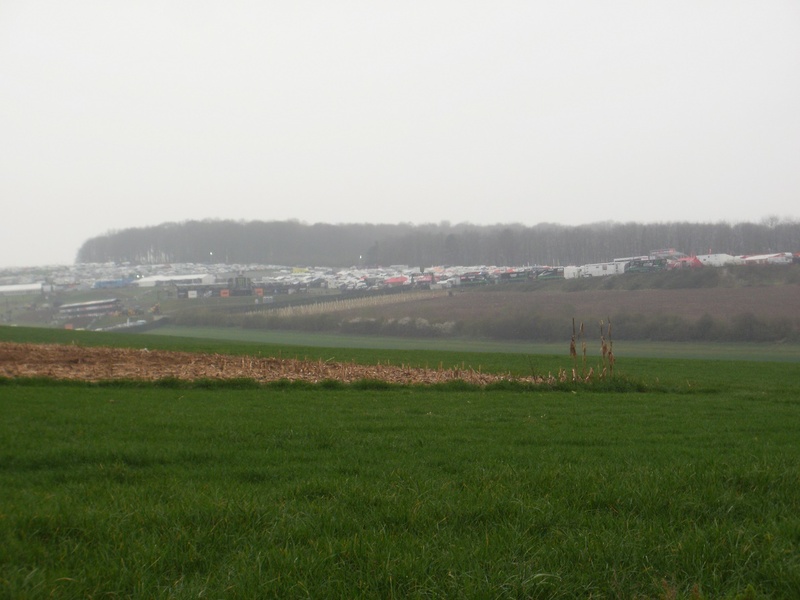 We followed the SDW as it skirted the Motocross event, passing between the car park and the campsite. Here there was a block of portable toilets: I was once told by a very, very experienced walker that one should never, ever pass up the opportunity of a toilet while out walking … so I didn’t, and these were of a pretty good standard. We walked on, and passed the throng of people, cars, tents, caravans, and then it was peaceful countryside once more. We passed other walkers and cyclists coming the other way. And told them all about the motocross – and the toilets. Most brightened up noticeably at the mention of those toilets! Not just us out walking! There followed a pleasant, but cacheless walk of a few miles, across the downs, then over the A272 and along a track past a farm. The noise of motorbikes gradually faded. It got brighter, and warmer. There were shadows! It had turned into a lovely spring day. A little later, we reached at the Milburys pub http://themilburyspub.synthasite.com/ We’ve visited it before (for research, obviously!) and it’s a friendly place with good food, and good beer, too. 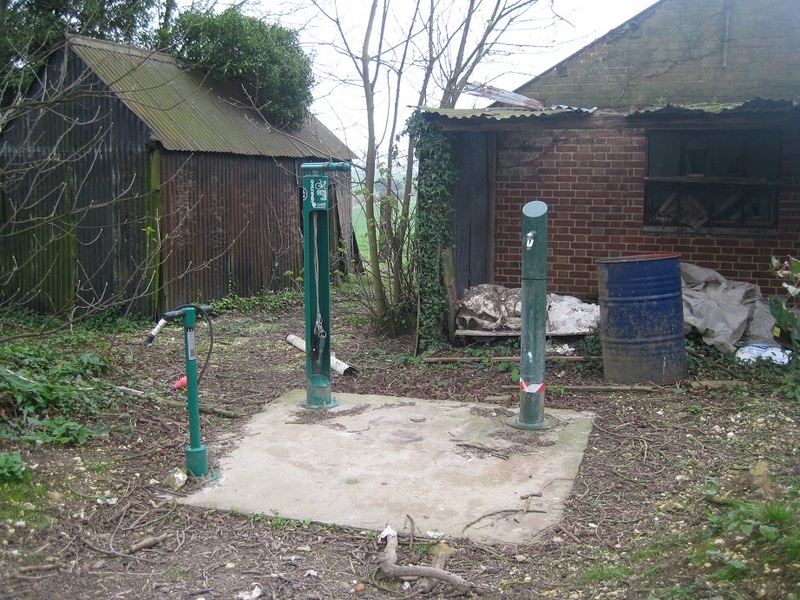 One thing of interest inside is a 100 metre (300 foot) well down through the chalk to the water table, where water can be raised using a treadmill. If you ask the bar staff, they’ll supply an ice cube that you can drop down the well, to wait for the splash. One other thing of interest is that this is one of the very, very few pubs you’ll pass on the SDW, so make the most of it! Somewhere around the Milburys, we had found three more caches, two of them multicaches, (with a start point somewhere else), but we’d worked out the coordinates earlier on, so we didn’t have to backtrack to find them, and the third a puzzle cache, based on codebreaking, which I had great fun working out. 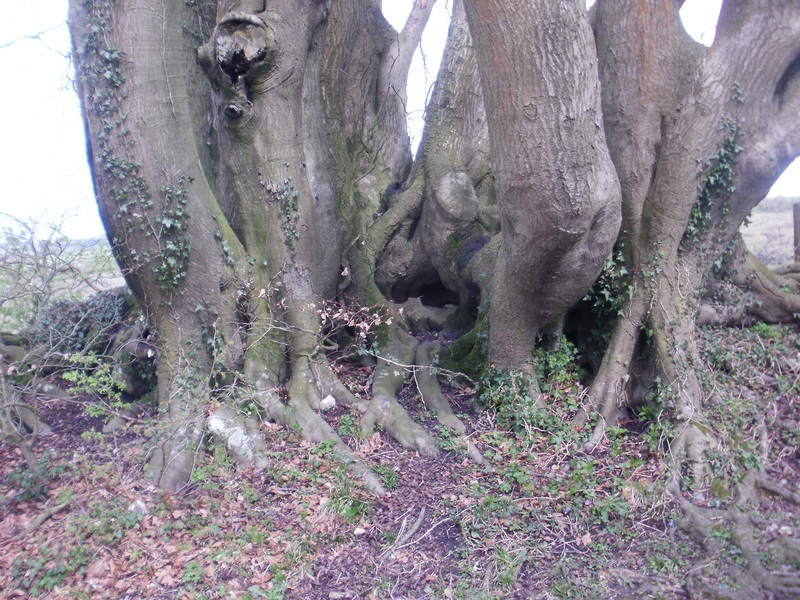 Editor’s note: the locations are deliberately vague – if you want to find the caches, you need to solve the puzzles yourself …. 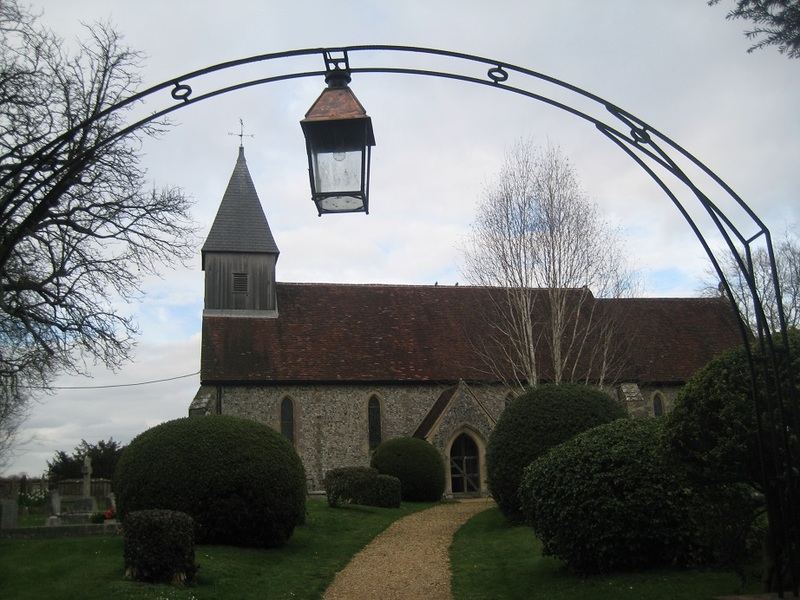 Further on, we came to Lomer, which was a village in the 1500s, but is now a single farm, with a few lumps and bumps in a field where the village once was. 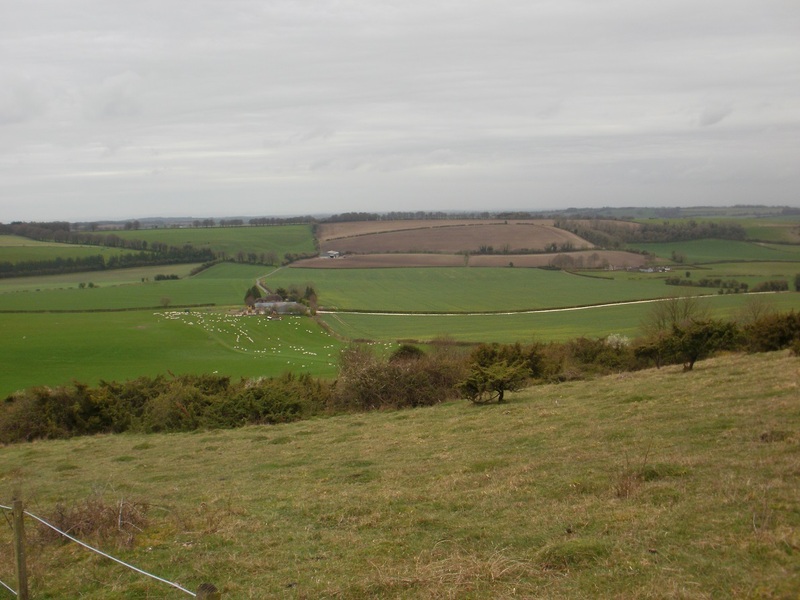 From there, it wasn’t far to Beacon Hill; there had been a gentle ascent of about 50 metres from the Milburys to Beacon Hill and then a steep, steep descent of more than 100 metres into Exton, in the Meon valley. 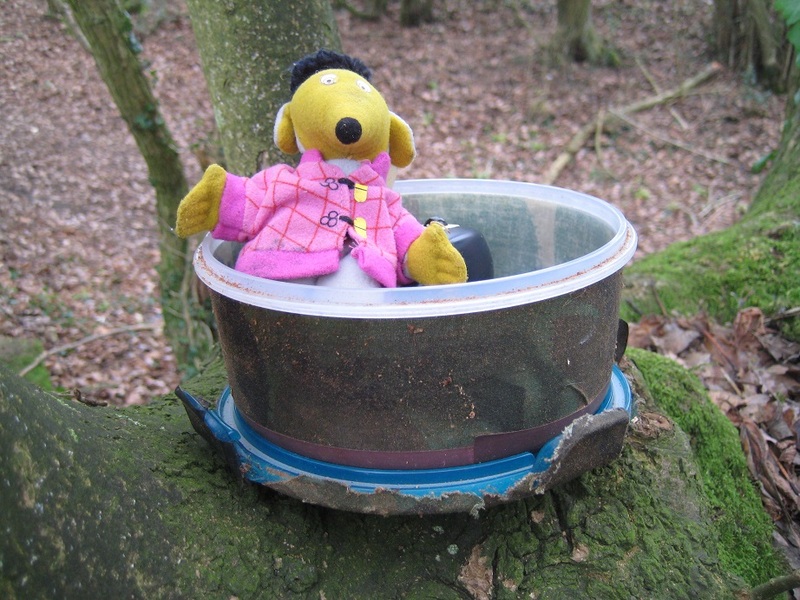 There were some caches to find along here, which was good, they gave my knees a few chances to rest on that descent! 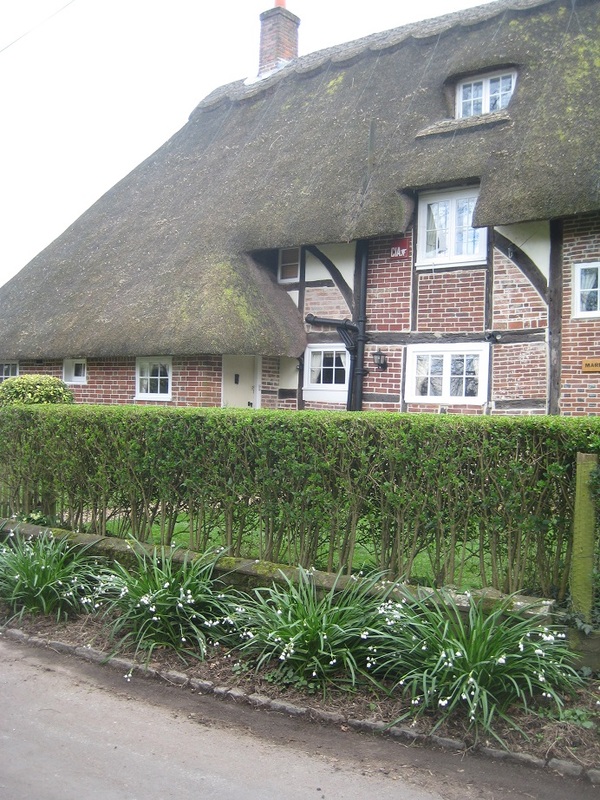 Exton is a pretty village, with thatched cottages, a flint-walled church, a village pub and shop, and the River Meon flowing through. But we were blind to that, we had more caches to find. 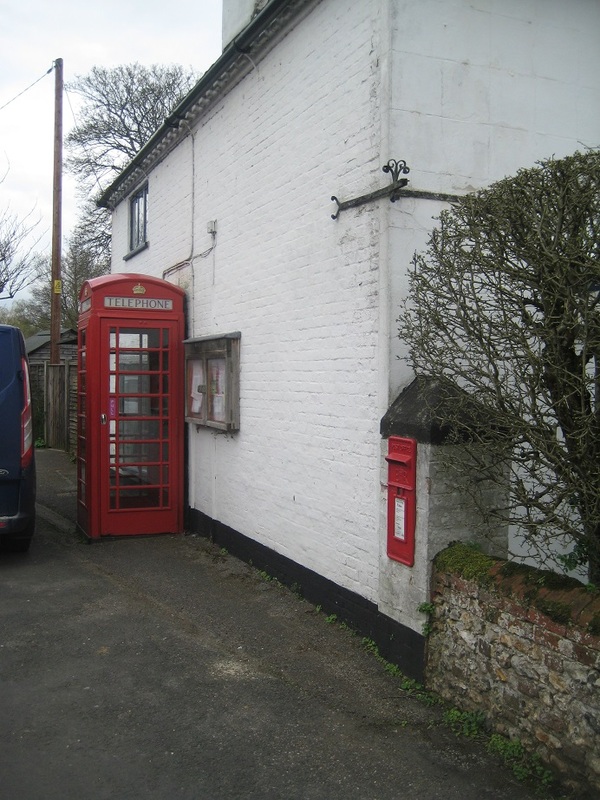 Two were from nationwide cache series: one, a Church Micro, the other, from the Fine Pair series (a red phone box and post box within sight of each other). 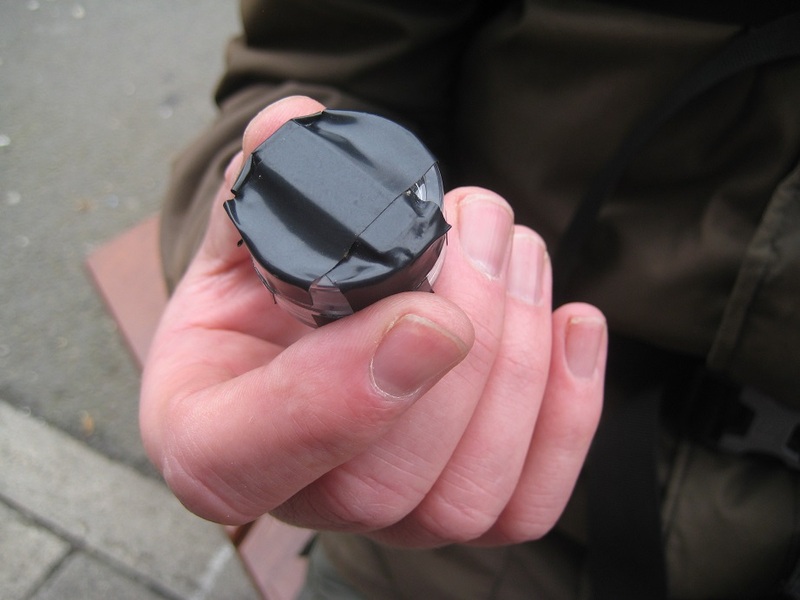 For one of these, a parked van shielded us from the drinkers at the Shoe Inn while we did the searching, and for the other, we waited for the local lads to finish their football game in the street before making a quick grab for the cache. Almost finished now, we had a short walk alongside the river, stopping for one final cache, a large old ammo can, before returning to the geocar and heading homewards. 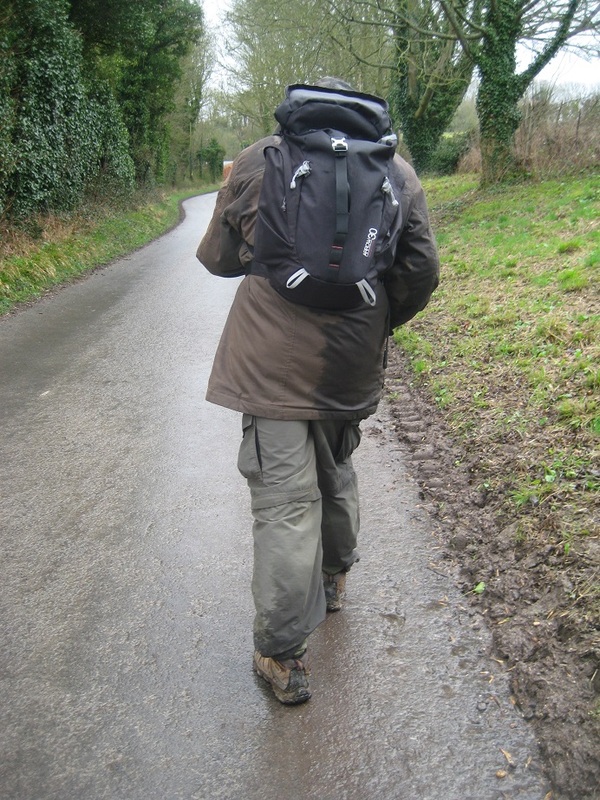 Editor’s note: we walked the SDW back in 2011, before we were cachers, and remember that there was a dearth of water taps. We found three ! on this walk alone, though one of them wasn’t working. 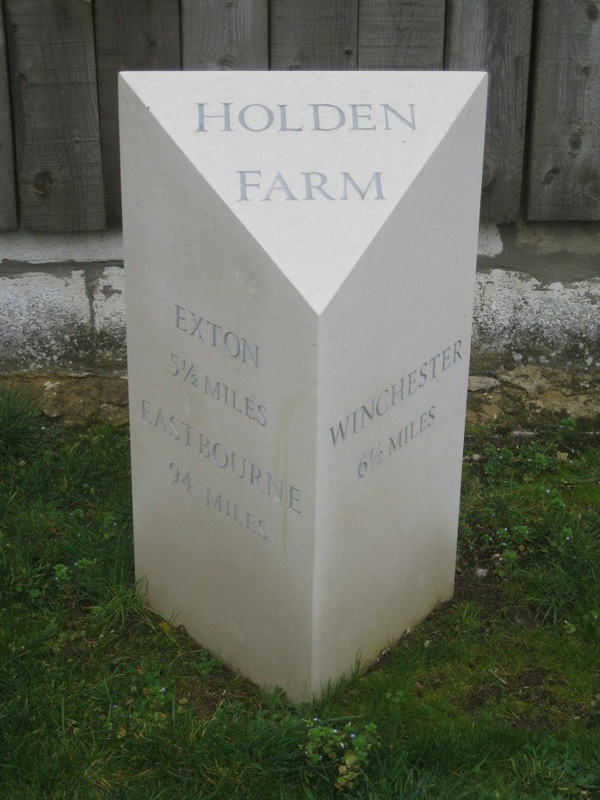 There was one near Cheesefoot Head, at a sort of service station for cyclists, one at Holden Farm near a milestone erected by the farmer (we saw him and asked about it), and one at Lomer Farm, near Beacon Hill. 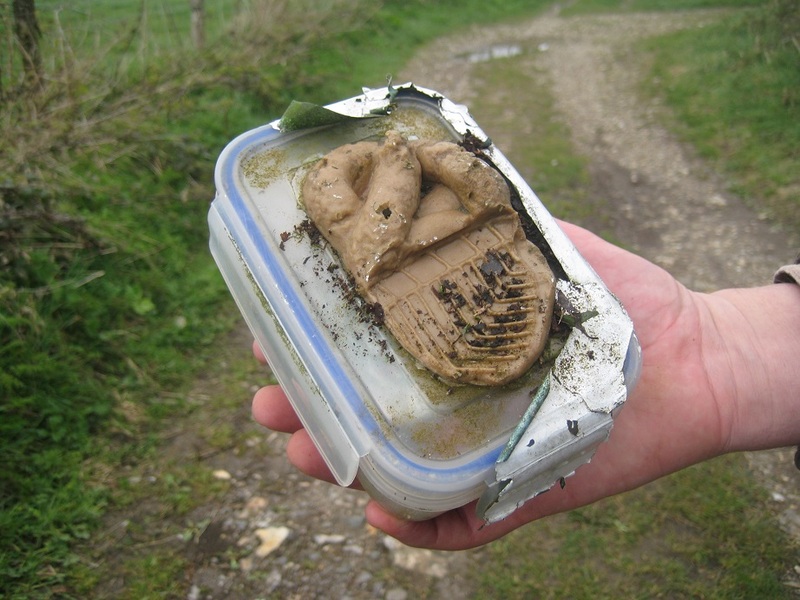 Back in 2011, a year before we started geocaching, we walked, over a period of 6 months, the 100-mile long distance footpath – The South Downs Way. Since then, Mr Hg137 has been asked on numerous occasions to give a one hour talk on our walk and our photos have proved invaluable. However, we were aware those photos are 8 years old! 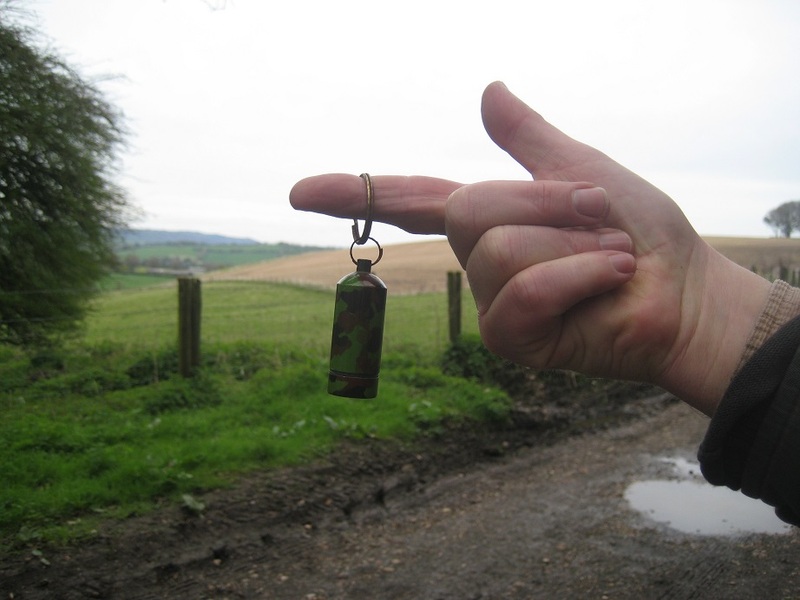 So this year we intend to revisit the South Downs Way, review our pictures and our knowledge and, of course, find some caches too! 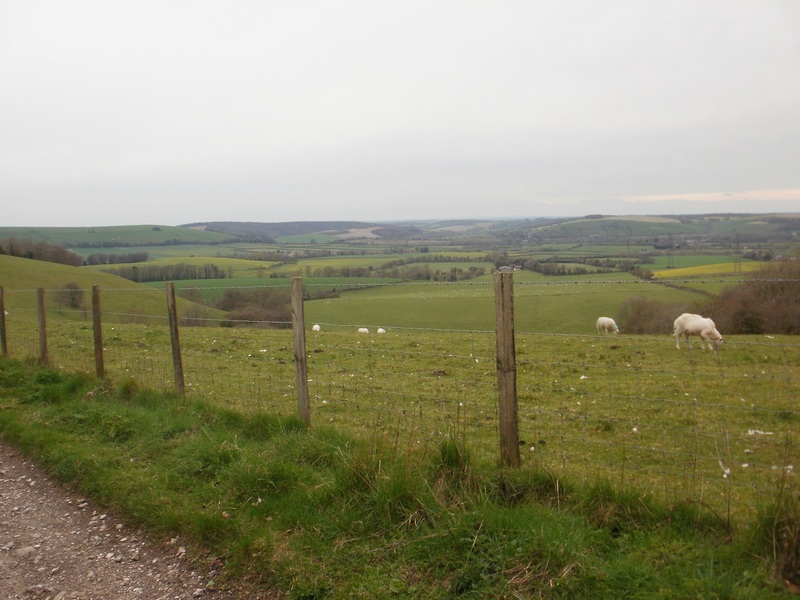 The South Downs Way runs from the Roman/Saxon city of Winchester to the Seven Sisters at Eastbourne. 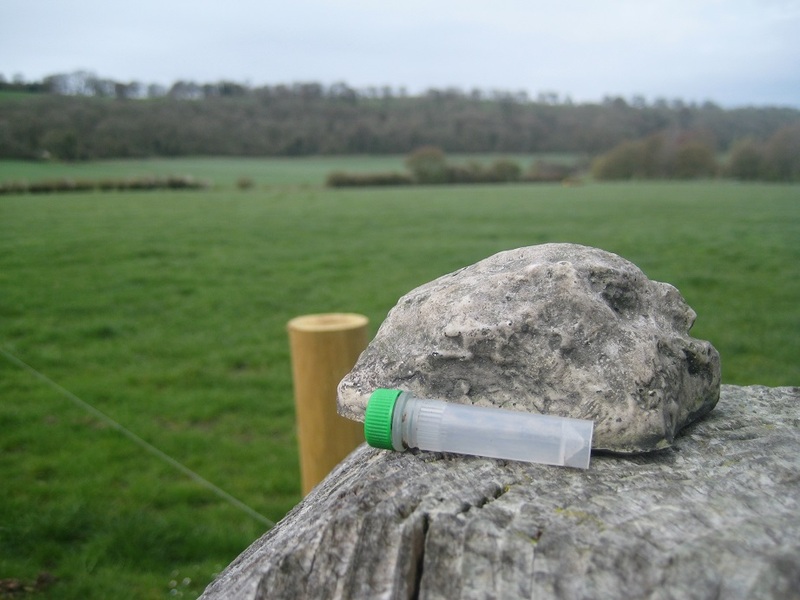 Our first caching tour would take us around Winchester’s Centre and then a short 3 mile walk to Cheesefoot Head. 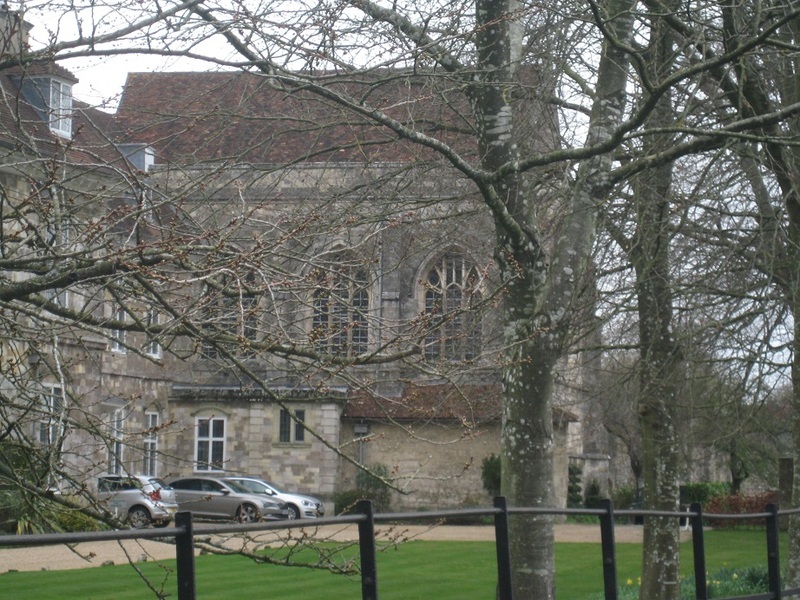 Winchester City Centre is relatively small but packed with treasures. At one end of the High Street is the Great Hall (hosting an imitation Arthurian Round Table). Halfway down the same street is St Swithun’s Cathedral and at the end furthest from the Great Hall, King Alfred’s Statue. 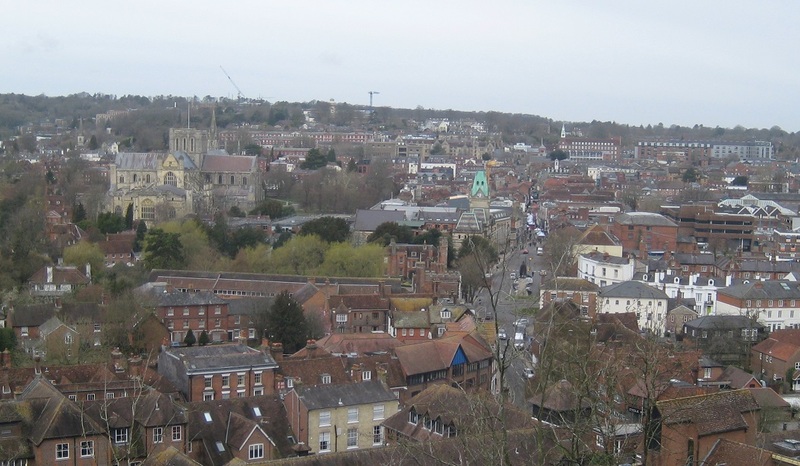 Our caching trip started on the outskirts of the City with elevated views along the High Street. 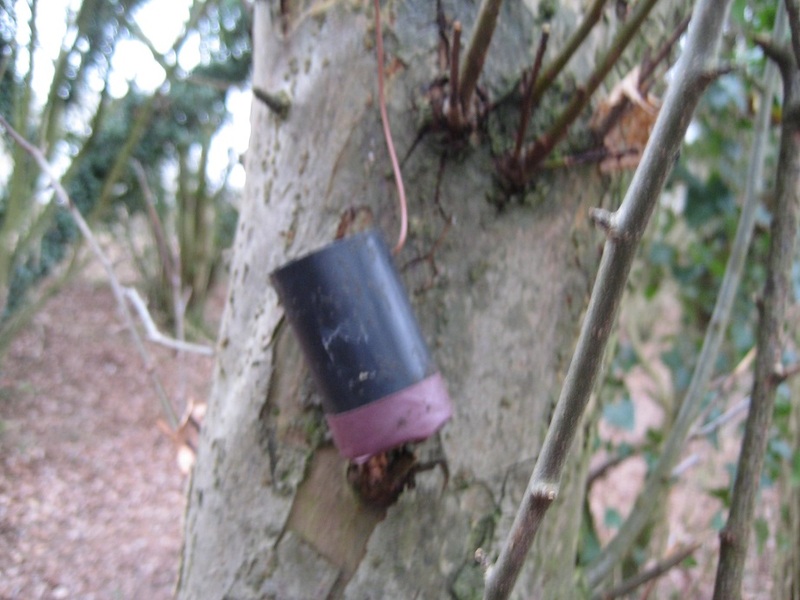 Two simple caches (one under a seat, the other in tree roots). 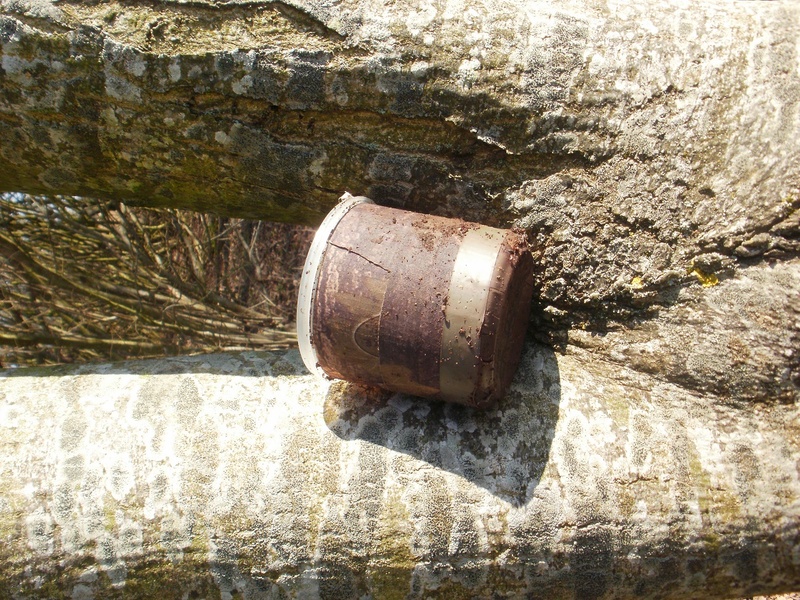 We also found in the general vicinity one of two puzzle caches we had solved. This puzzle consisted of three (straightforward-ish) logic puzzles to derive the final co-ordinates.. and then the fun started. 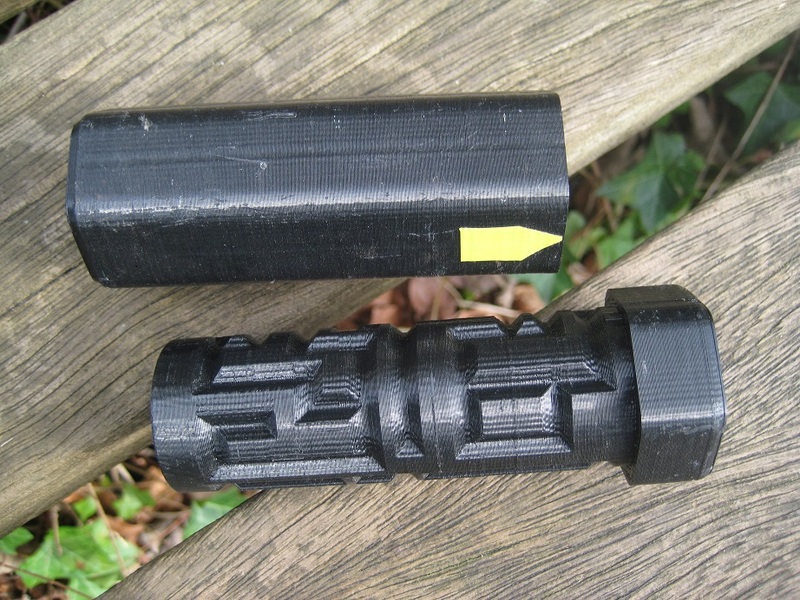 The cache could only be opened by unscrewing the container revealing a hidden maze! Fortunately a nearby seat meant we could sit down during our 20 minute attempt! After 20 minutes the cache was open..now we have to put it back! 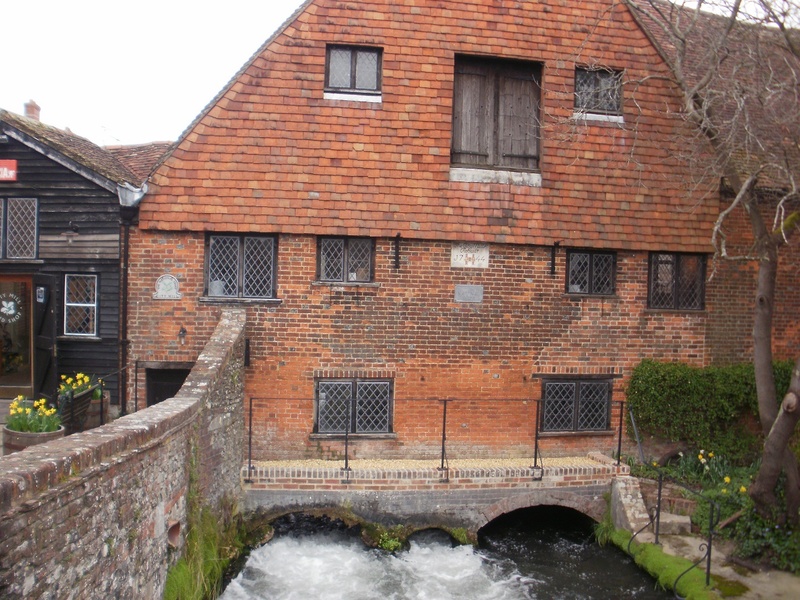 Down at the High Street, we paused by the Museum/Mill where the South Downs Way officially starts. 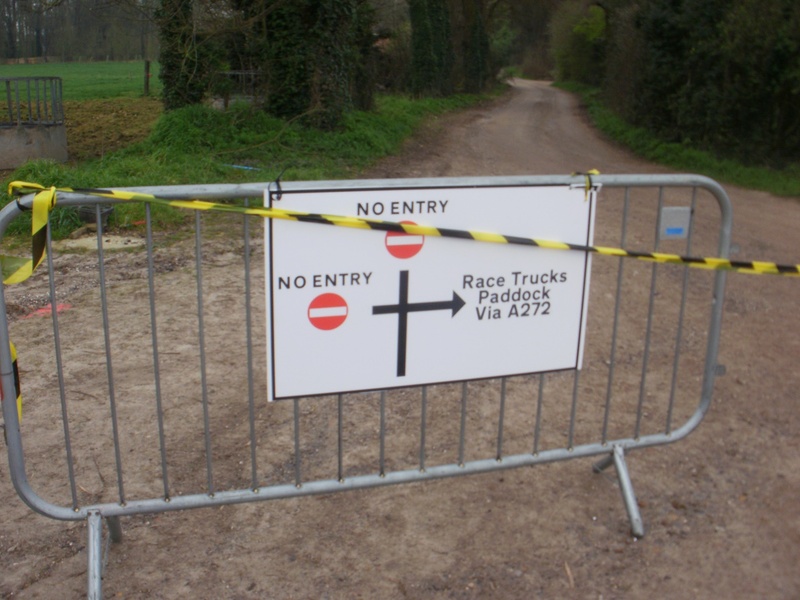 Back in 2011 we had been perturbed as there was no official start point, but this has since been rectified. 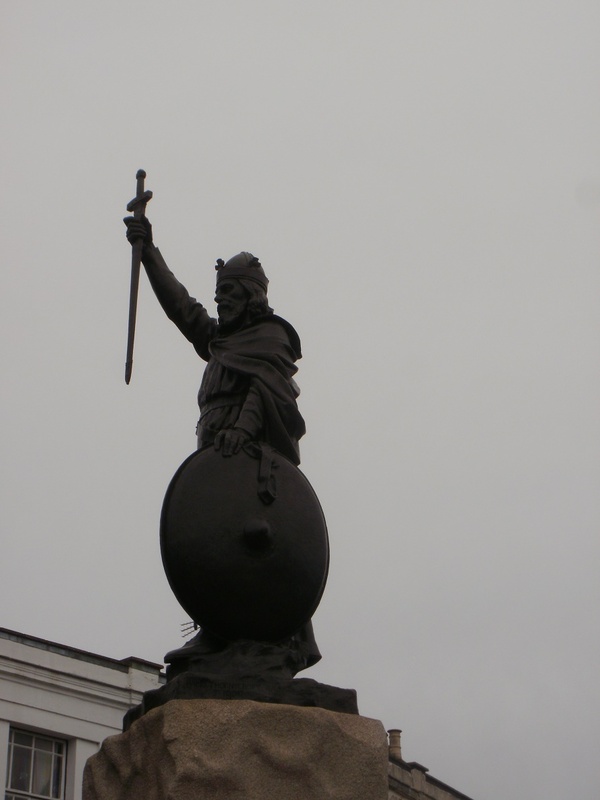 Nearby is King Alfred’s Statue. Erected in 1899 to mark the centenary of the warrior king’s death, the 17 foot statue stands on a two granite bases. 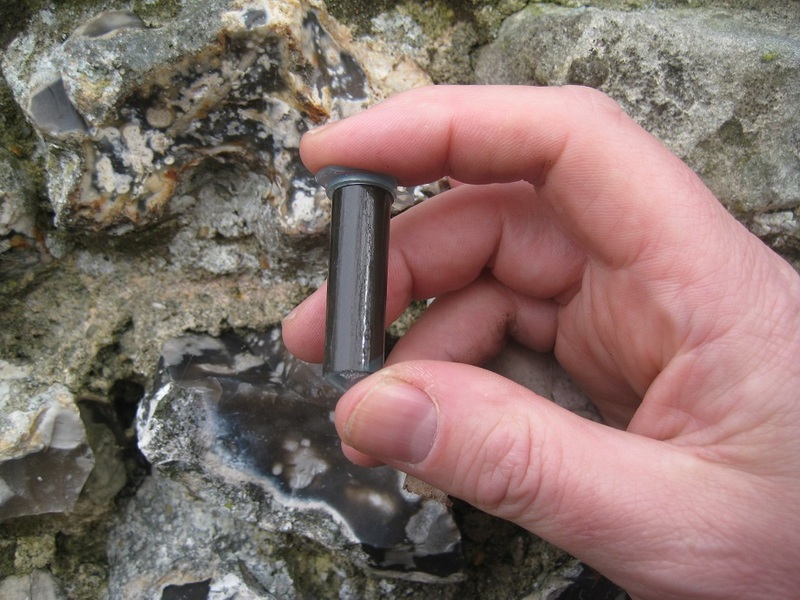 The different types of granite form the basis of an Earthcache, which we managed to successfully answer. 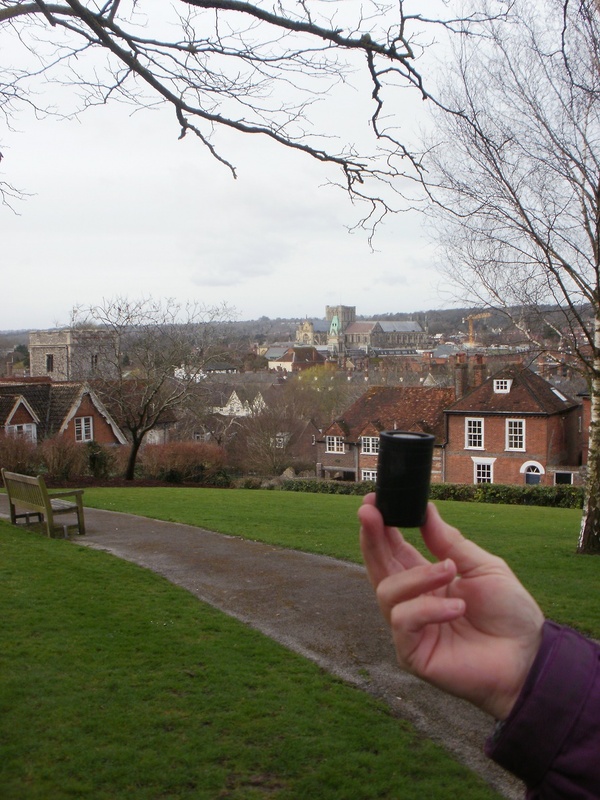 We had a three more caches to find in the City Centre including another simple puzzle cache (found in a less-than-exciting car park) and a beautiful snail cache close to Winchester Cathedral. 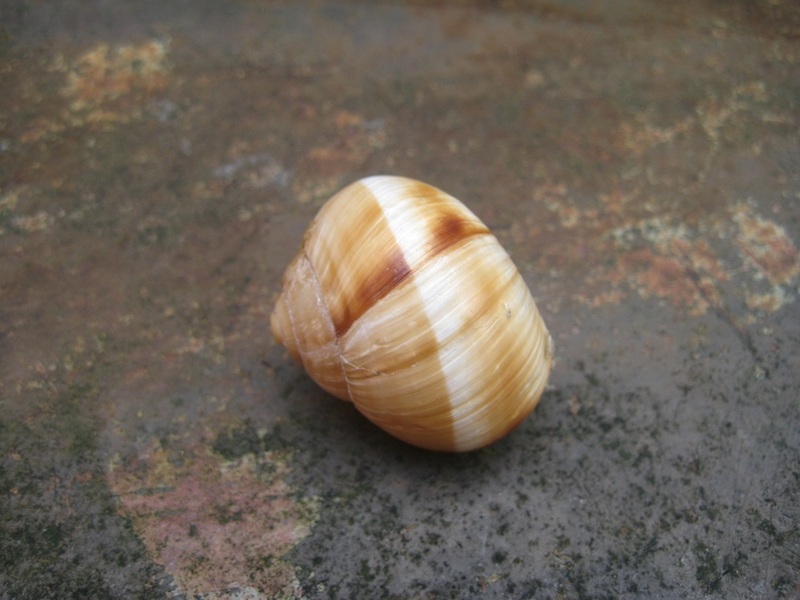 A Snail for a Diver! 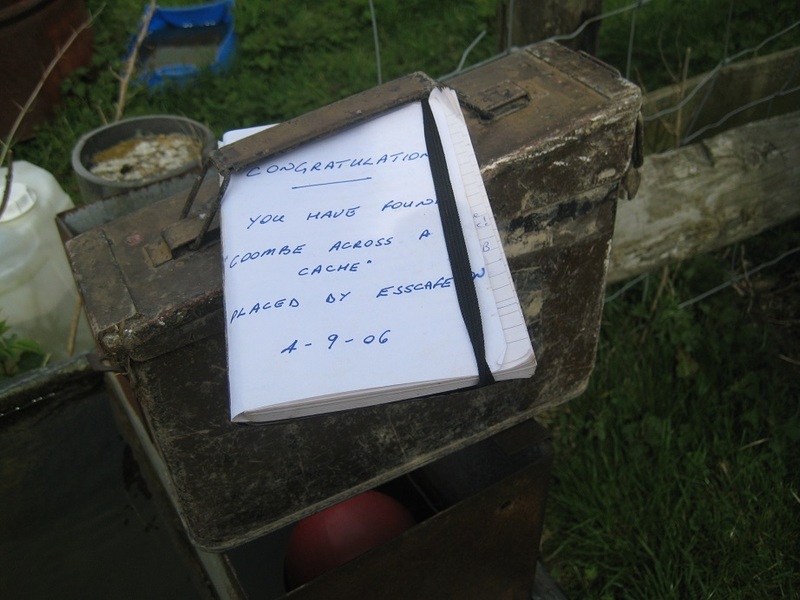 This cache was a tribute to the Diver, William Walker. Between 1906 and 1911 he dived 20 feet every day in water under the sinking Cathedral foundations and laid 25,000 bags of concrete, 115,000 concrete blocks and 900.000 bricks. 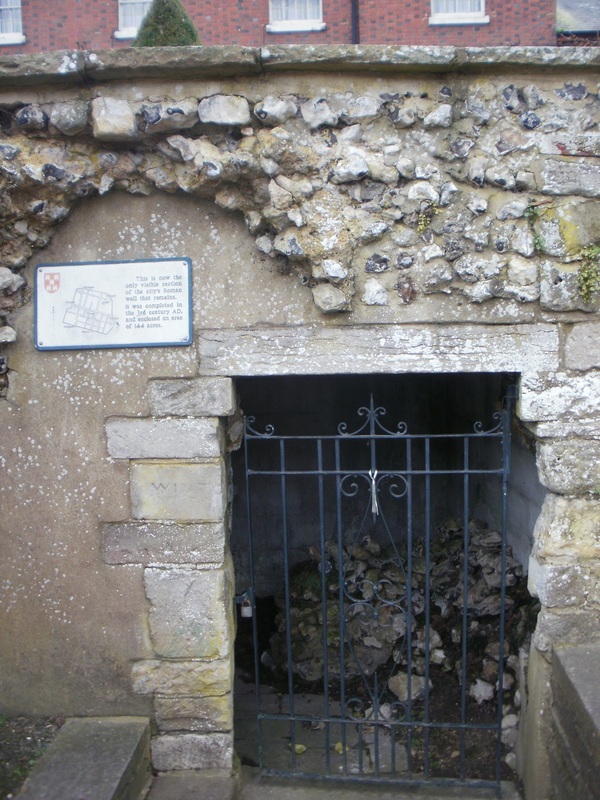 This enabled the excess water to the drained, and the Cathedral re-stabilised. Without his work the Cathedral would probably have fallen down during the 20th Century. Our final City Centre cache was in the busy High Street. Full of shoppers and tourists. 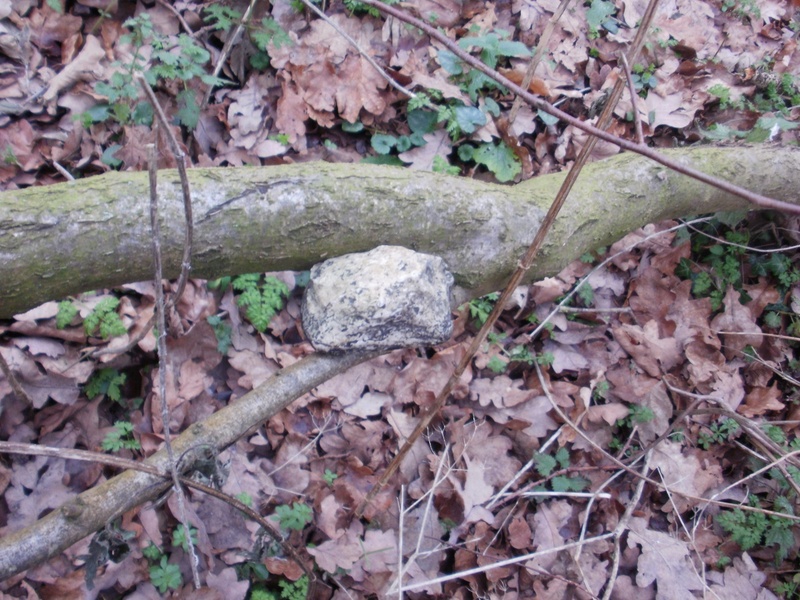 The cache was placed exceedingly high (only Mr Hg137 could reach it), so it was almost impossible to grab it in a nonchalant manner. 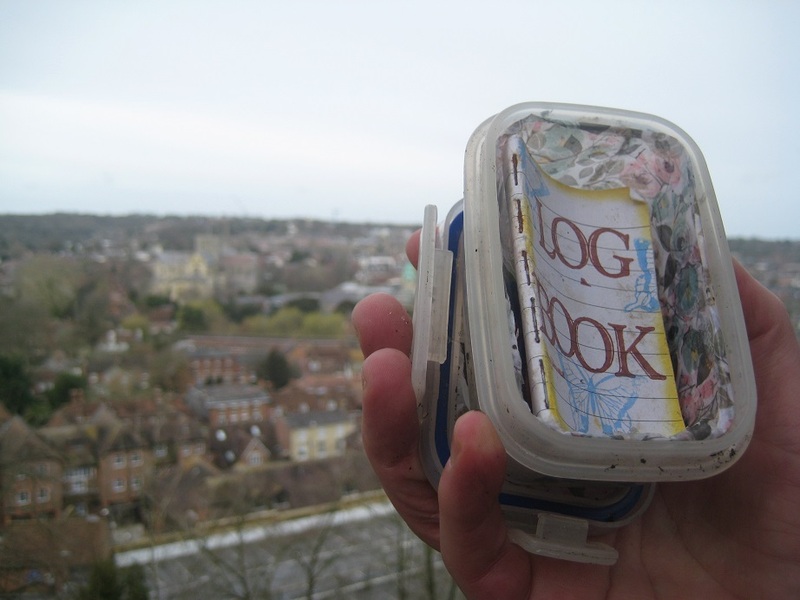 There are more caches in the City Centre, many of them puzzles, but 7 finds seemed a reasonable reward for a morning’s exploring the ancient City. We lunched in a park near King Alfred before setting out on our re-walking of the South Downs Way. Ominously, the skies had become more overcast but we were confident we could walk the 3 miles before the forecast rain was due. 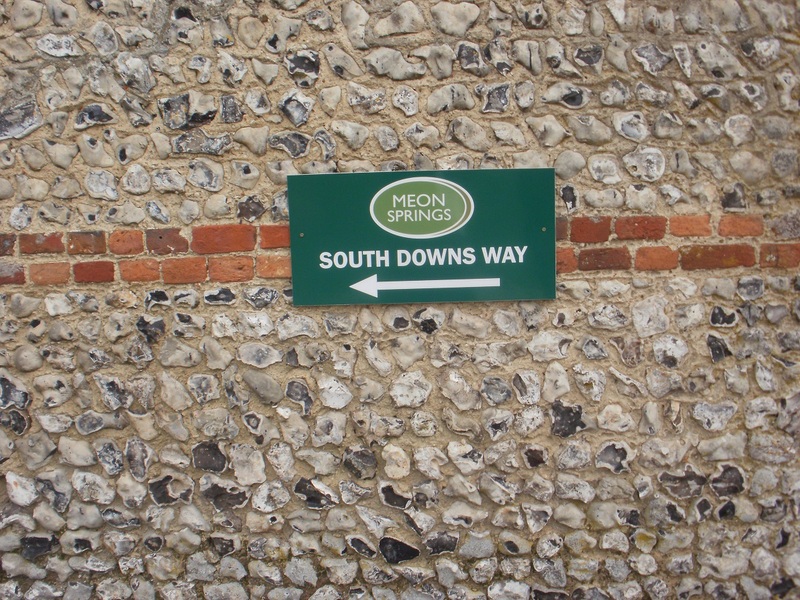 The South Downs Way leads away from the Museum/Mill following the banks of the River Itchen. 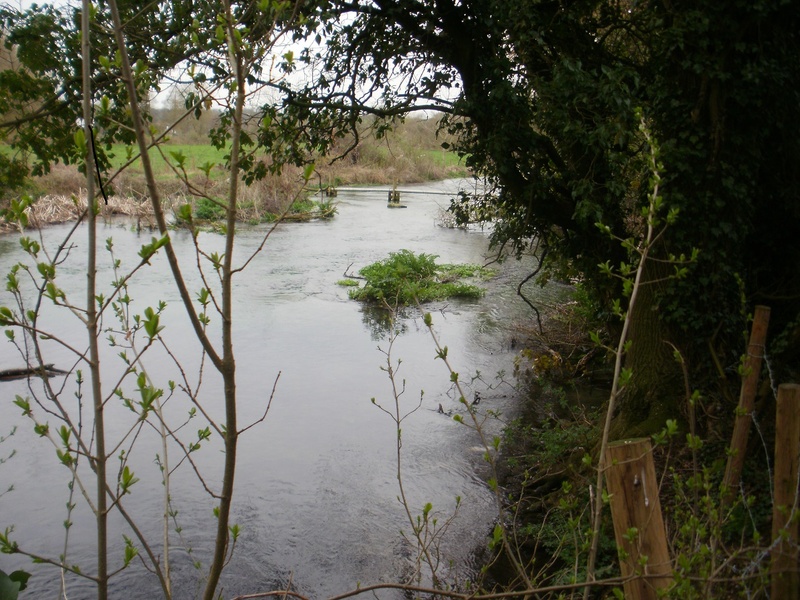 A very pleasant river, bubbling along between gardens on one bank and ancient Roman walls and Wolvesey Castle on the other. When we walked the path in 2011 we knew we went wrong on this part of the walk and today we understood why. 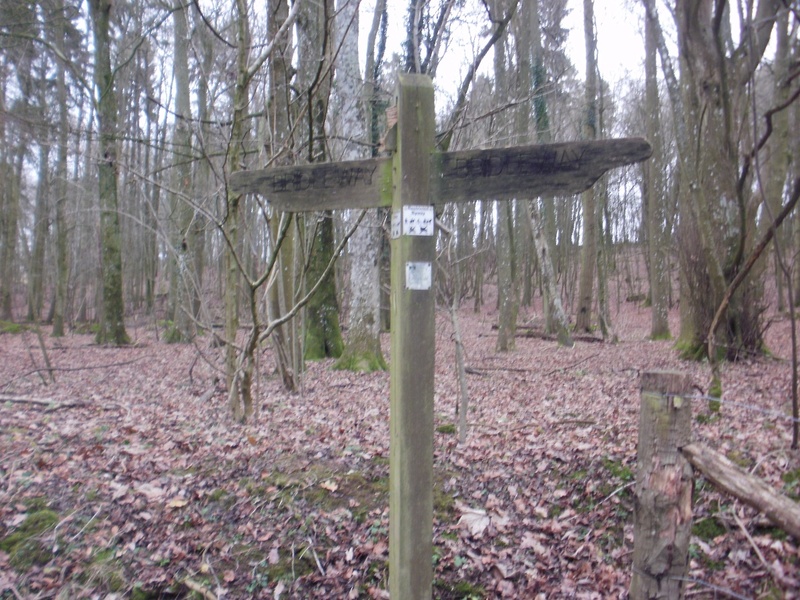 A South Downs Way signpost, set slightly back from our path pointed us away from the river at a very subtle angle. No wonder we missed it before. 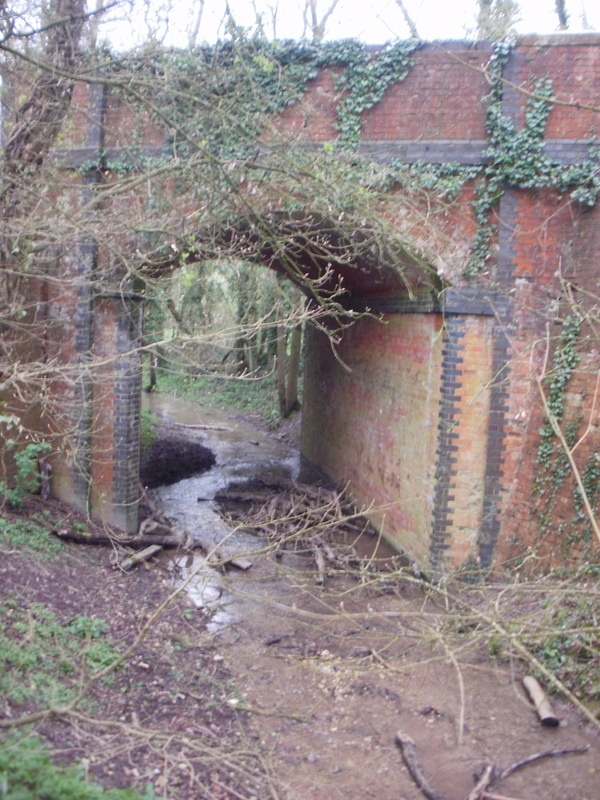 We walked on, and took a slight diversion to a cunningly concealed cache on a bridge over the River Itchen. Back on the South Downs Way we had a mile of street walking. A mile we were dreading. Probably the least scenic mile on the South Downs Way ! The road leads to the M3, and a small bridge. But as we arrived, the rain started. 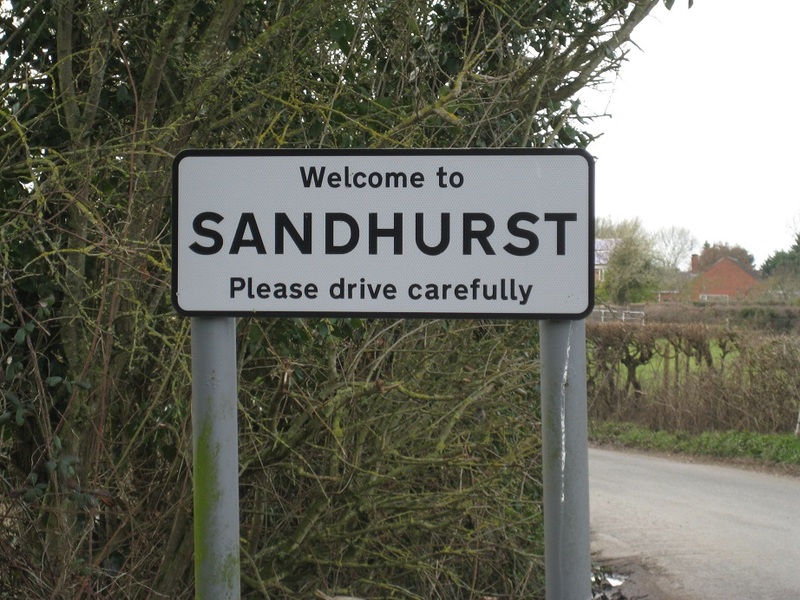 Should we walk for 20 minutes to our car in Winchester or press on for 45 minutes to our car at Cheesefoot Head ? We choose the latter and regretted the decision for the rest of the walk. At last ! Beautiful Countryside…in the Rain! 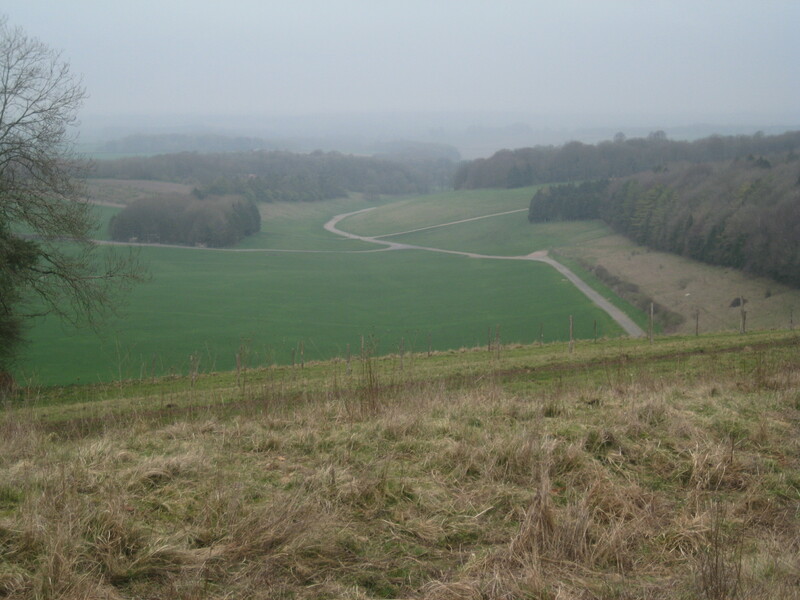 What should have been views of light-rolling chalk downland was instead wet-slippery chalk shrouded in low cloud mist. 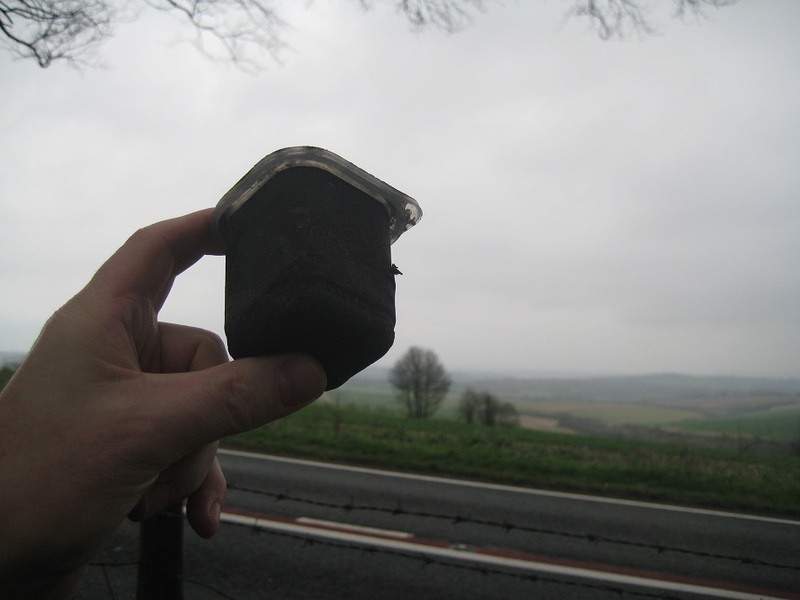 To compound our misery, our final cache of the day – the first genuine South Downs Way cache – had gone missing. 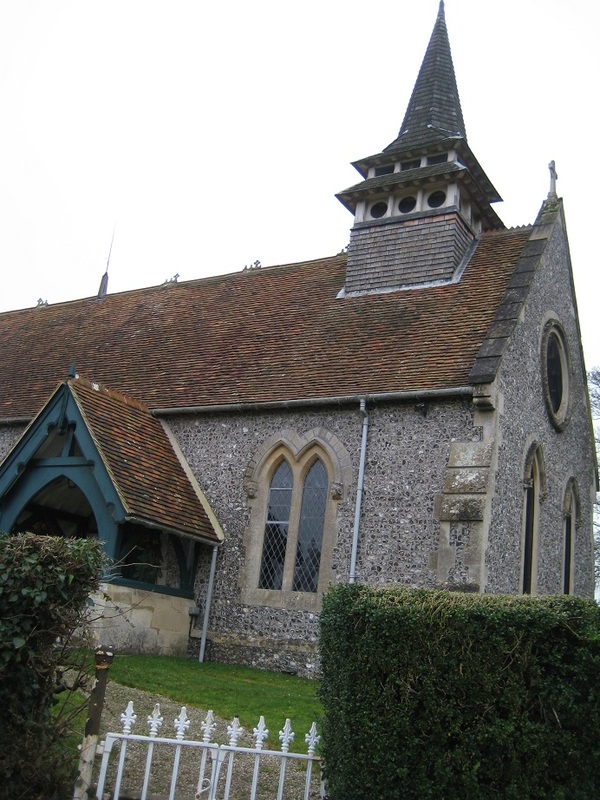 The rain was so heavy we decided against visiting Chilcomb Church to attempt a 3 stage Church Micro, and also the cache hidden yards from our car at Cheesefoot Head. That cache will wait for our next expedition. 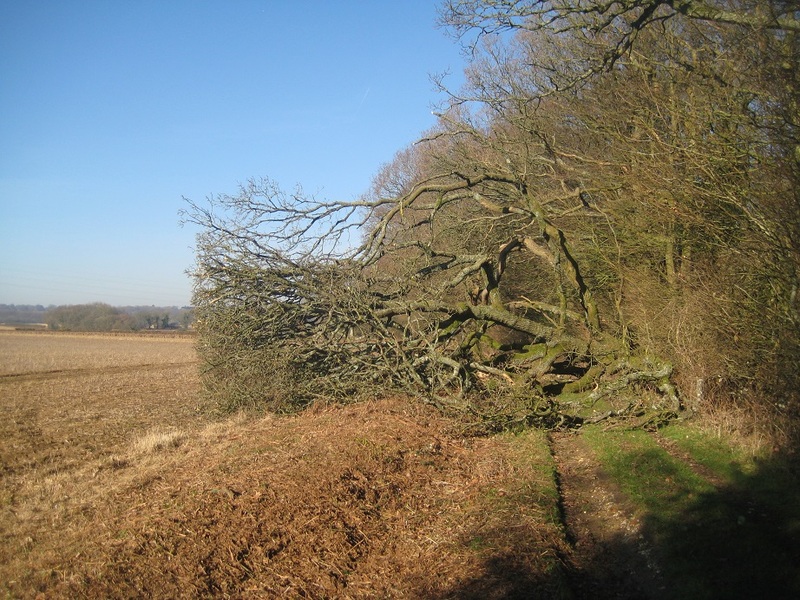 So our 2019 quest has started – revisiting a walk we undertook 8 years ago. 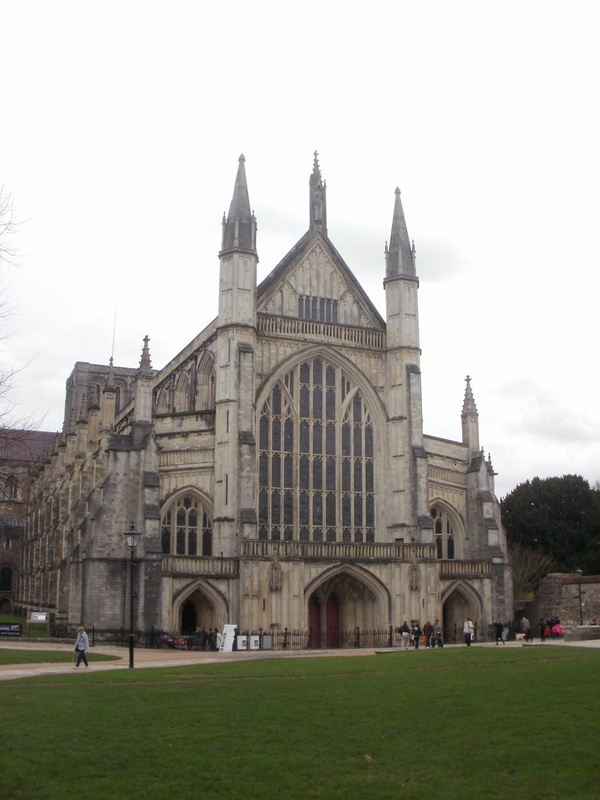 As yet no South Downs Caches found, but we did enjoy the variety and history of Winchester before we left. 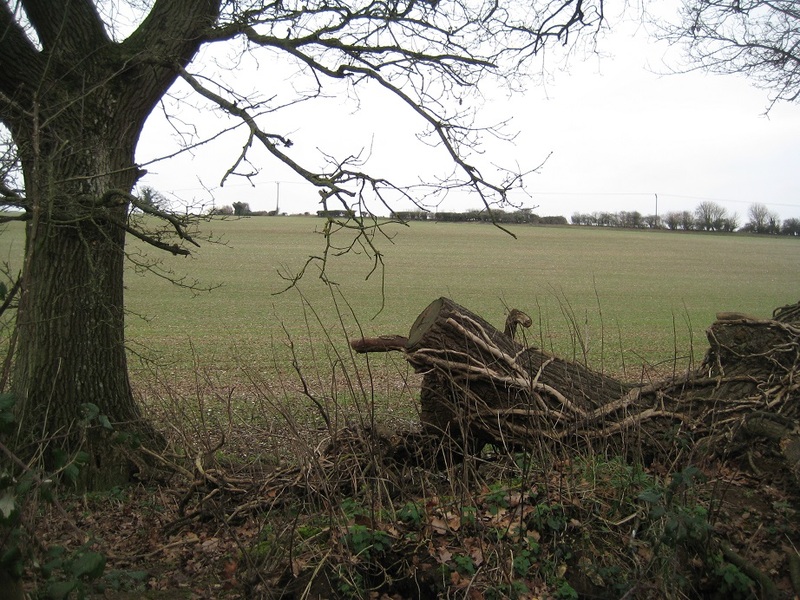 On the first Saturday in of 2019, we attempted a caching walk round Weston Patrick, south of Basingstoke. It was cold, very cold, and bleak, very bleak, with a damp wind that gradually seeped into the bones. We gave up halfway round, cold and miserable. 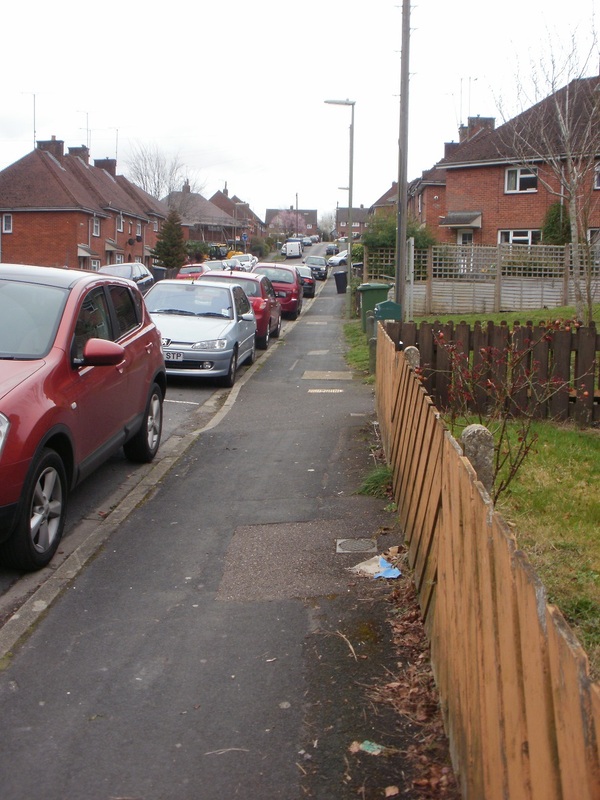 Six weeks later, we parked in the same place as before and started to retrace our steps, in reverse order, around the second half of the Weston Patrick (WP) series. But weren’t we in a different season? The sky was blue, not grey, the sun was warm, though there was still frost in the shadows, and there was a gentle, soft breeze, not a biting, cold wind. 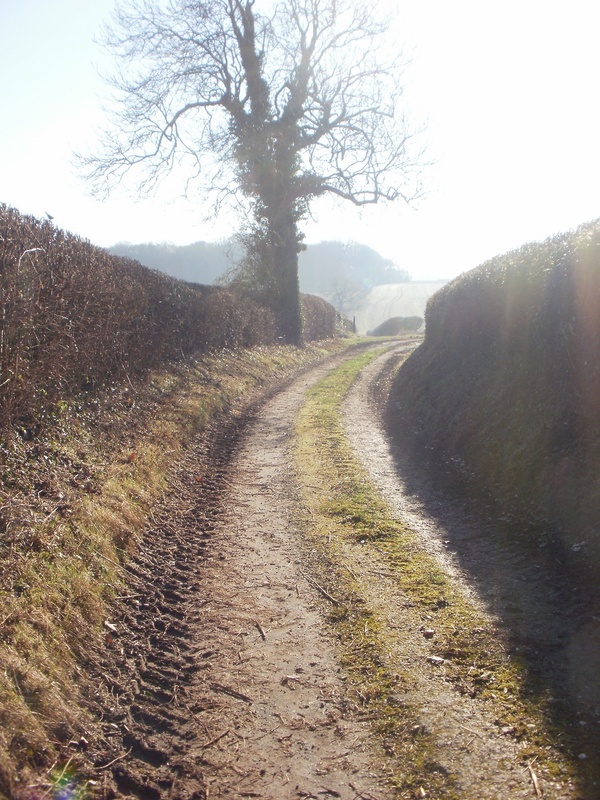 We set off to enjoy the walk, in sparkling, early spring sunshine, with skylarks singing overhead. 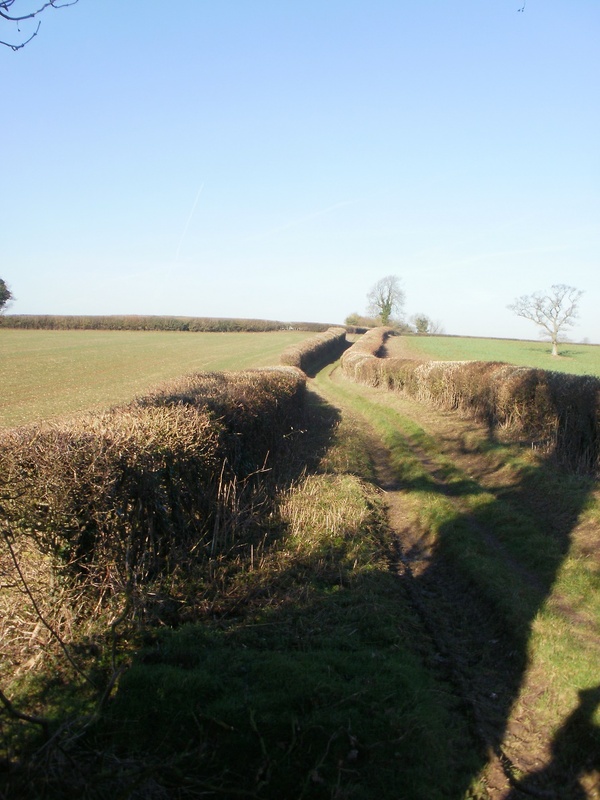 We skirted Weston Patrick village/hamlet on paths and a sunken lane, then walked gently uphill on a track between freshly cut hedges. 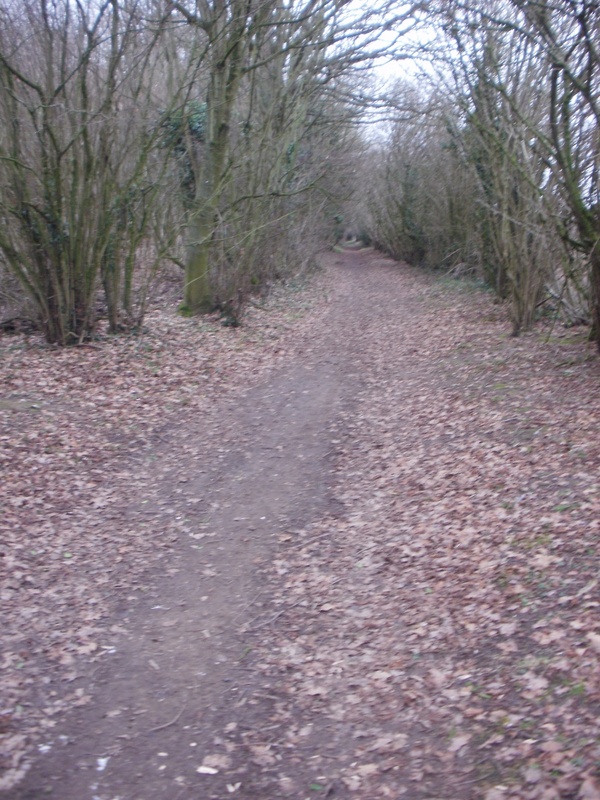 When the track ran out the path continued along a field edge, then into woods. 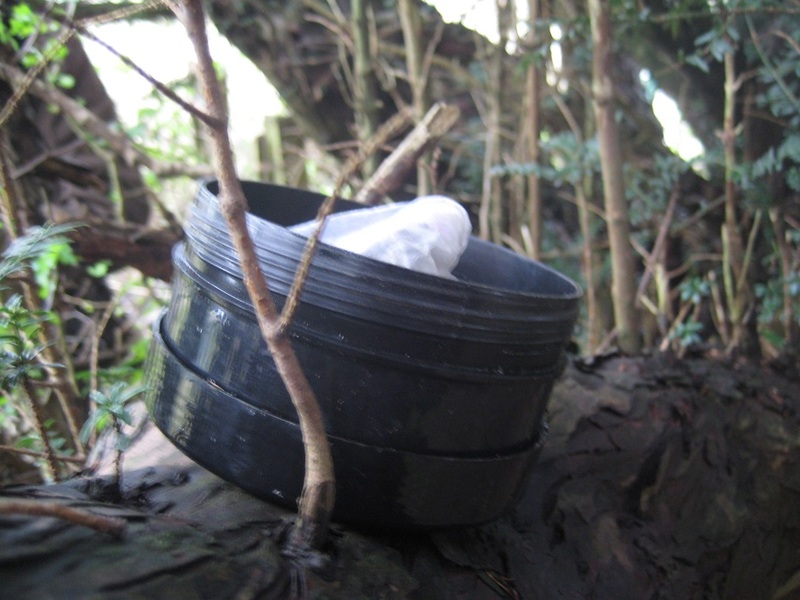 As we went, we paused to rummage in prickly hedges, behind trees, under stones, searching for geocaches, and mostly finding them. 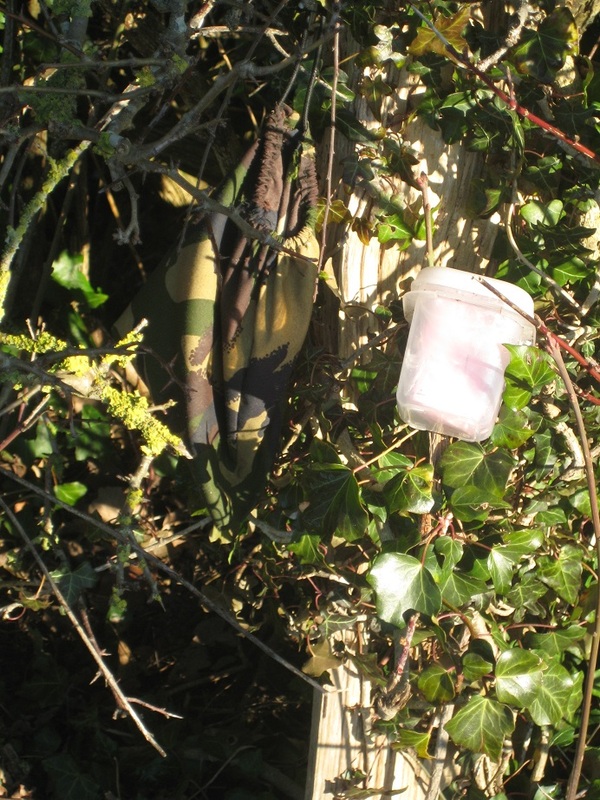 There were some interesting caches here, some hanging, some camouflaged, some attached by magnets, with a variety of containers and log books and a couple with ‘oooh’ Halloween-ish frissons. After a picnic lunch, we debated on the best route back to the geocar. 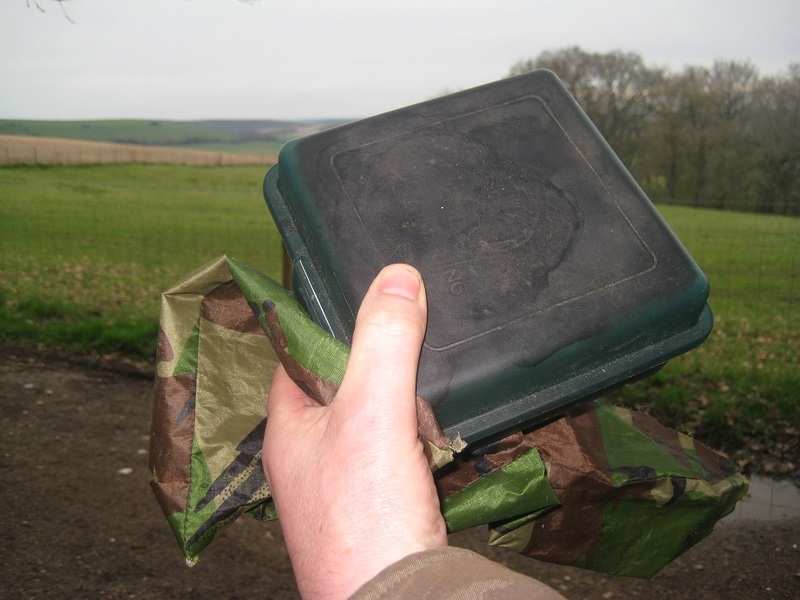 Should we retrace our way back round the first half of the WP series, looking for any caches we missed on our first visit? 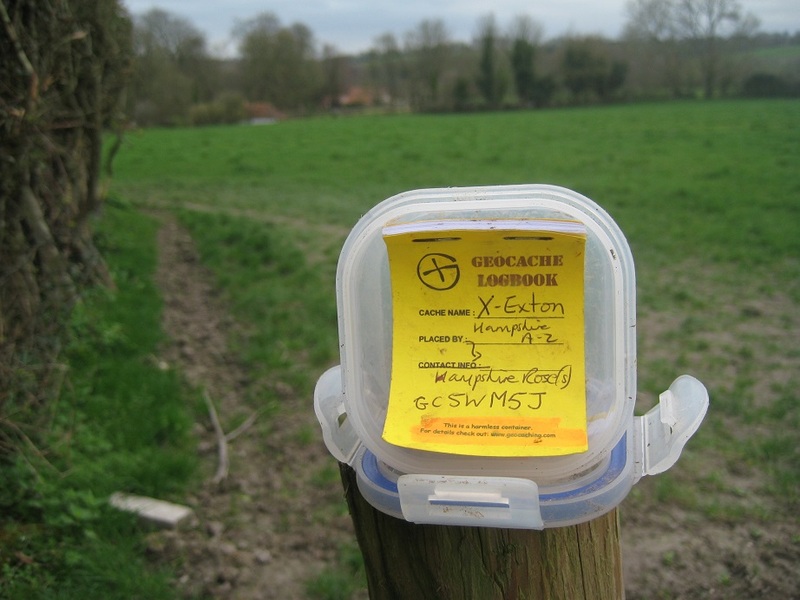 Or should we head back on a bridleway through the woods to find another solitary cache? We decided on the second of these, as it would mean searching for a different cache, not a re-search of somewhere we’d been earlier. This was a nice idea, and a very pleasant walk in the sunshine through more woods and fields, but it had two flaws: First flaw: we couldn’t find the cache (it’s quite old, seldom visited, left over from a caching event) : Second flaw: we didn’t realise, but we might have bumped into other cachers if we had chosen the other way. What a wonderful series! We have thoroughly enjoyed our walk round this afternoon and we only logged 5 DNFs. I think this might be my best day of caching yet! The weather was lovely and the scenery picture postcard perfect of the English countryside. We even got to see the moon as we made our way back to the car. Today I’ve managed to lose a hat, break my sunglasses, seen a dead pigeon (frankly this was very spooky and put me off the search at that GZ!) and my feet are a little sore! But I’ve had the most wonderful day … It was so peaceful and I enjoyed all the well thought out and interesting hides and containers. Thank you so much to the CO for setting out and maintaining this lovely series, a favourite point given ❤️ … don’t think I’ve walked that far in ages! 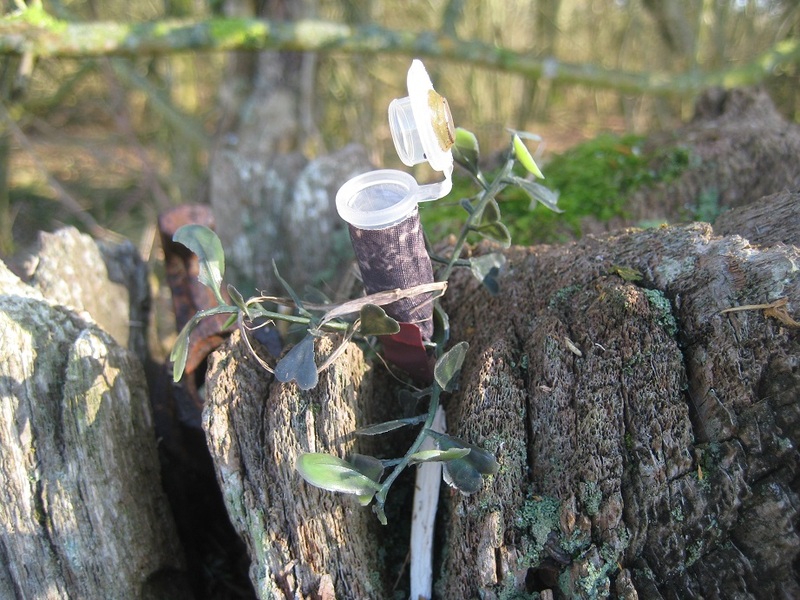 Here are some of the caches we found. 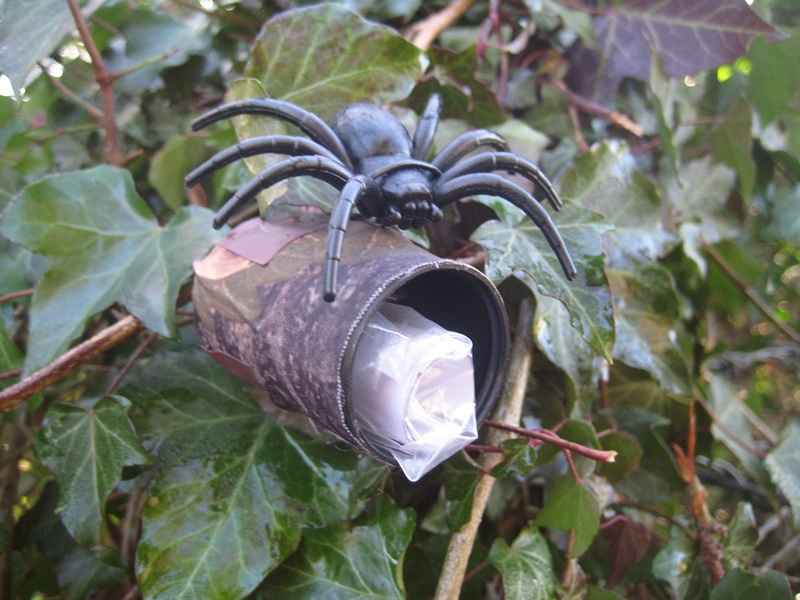 Some of the others will appear in our ‘caches of the year’ post later on. The first Saturday of 2019 seemed a good time to get out for a walk and some geocaching to counteract the eating excesses of Christmas. As the days were still short, we chose somewhere local (ish), Weston Patrick in Hampshire. 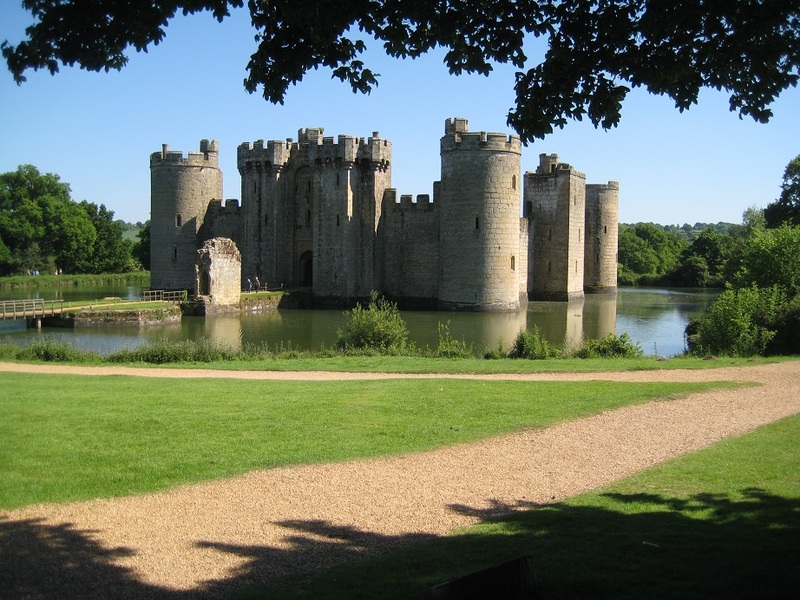 We have walked around here before (the Three Castles Path), also cached around here (the Westeros and GOT series). 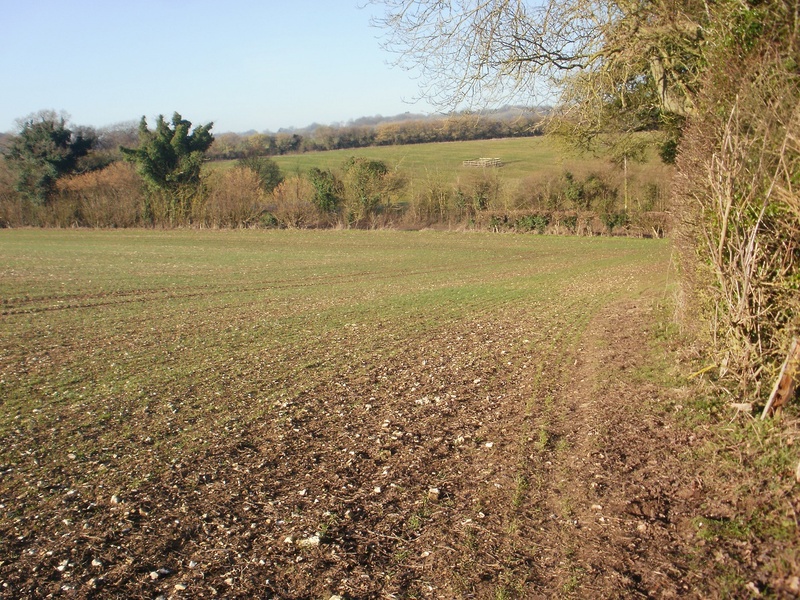 It’s good walking country around here, undulating and rural with woods and tiny villages. 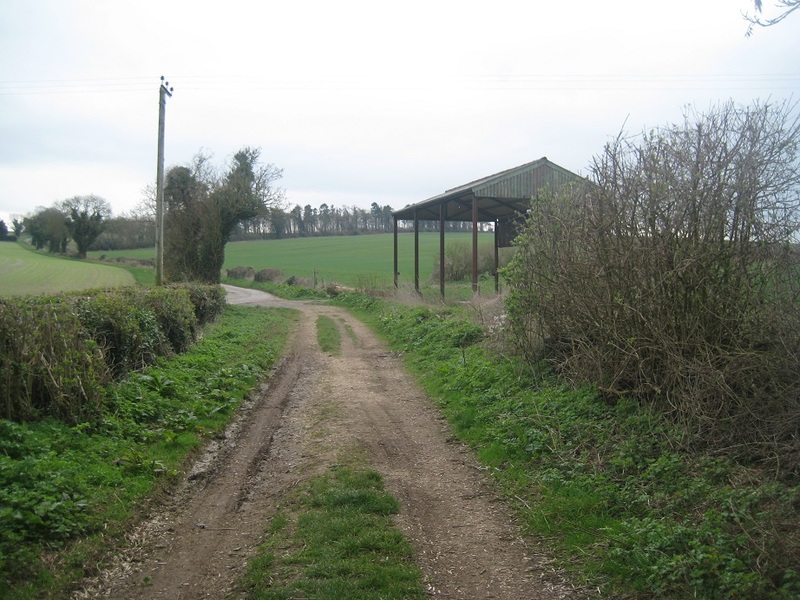 To summarise the route: it’s a great walk of just over five miles along tracks and paths, none of it on roads, starting and finishing at the hamlet of Weston Patrick. There’s a gentle climb over the first half, and a similar descent over the second half. 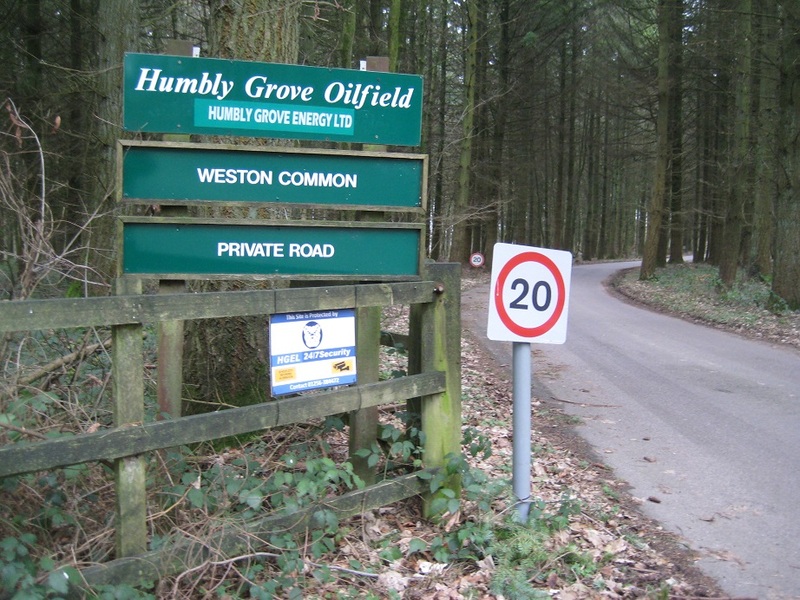 There’s quite a bit of woodland, a nature reserve at Closedown Wood, and, a surprise for us, a gas storage facility tucked away at Humbly Grove https://www.humblyenergy.co.uk There are 24 caches, some easy, some quite hard to find, and a mixture of hides. •	One: an almost instant find, signing the log, and satisfaction. •	Two: a long, cold search, checking everything at least three times, then finding the cache in an already-searched spot when on the point of giving up, and creeping despair. •	Three: a long, long, long, cold search, checking everything many times, then not finding the cache, giving up, and despair. 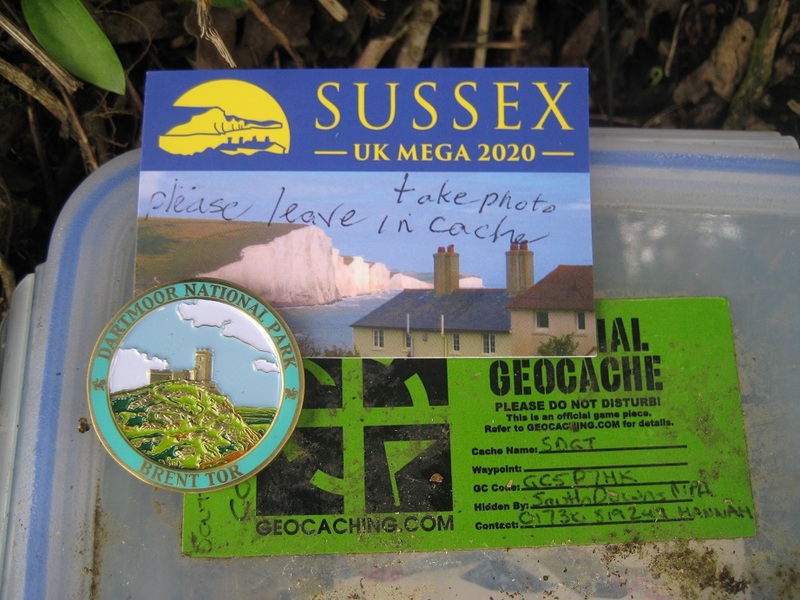 There was a variety of caches to keep our interest and tax our finding skills, and it was great to be out in the open air, but it was grey and dank, with a cool breeze, and the cold gradually seeped in during our category Two (eventually successful) and category Three (never successful) searches. After thirteen caches and eleven finds over about two and a half hours, we decided to head back to the car, leaving us with the second half of the series to complete on another, warmer day. We walked speedily down the hill (we didn’t get any warmer! 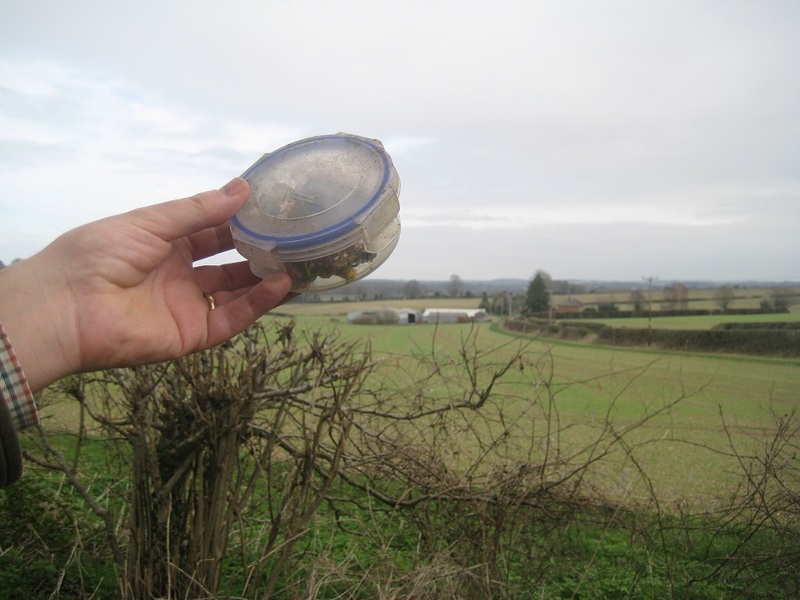 ), not stopping to look for more caches, then diverted very slightly to get a final cache for the day, the Church Micro (CM) at Weston Patrick https://uptongreychurch.co.uk/the-churches/weston-patrick We huddled in the porch to eat our lunch (we didn’t get any warmer!) 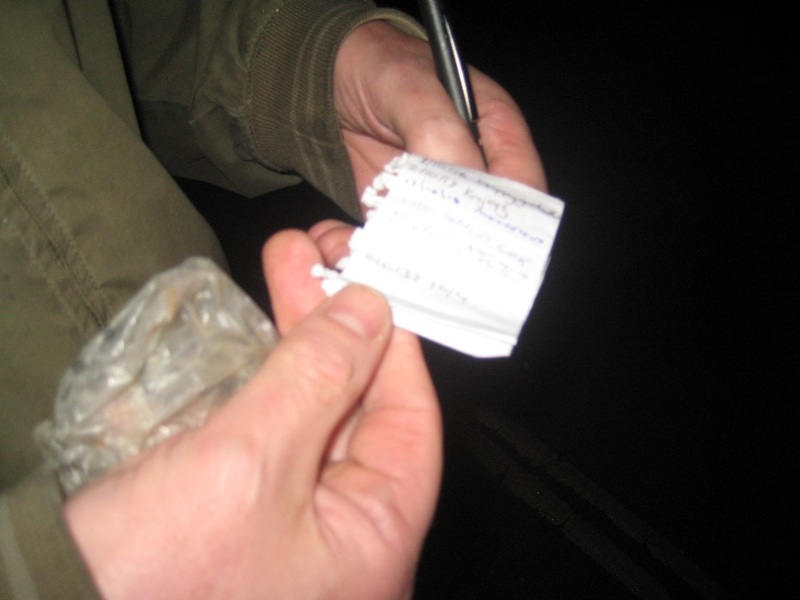 then found the information we needed to search for the cache. 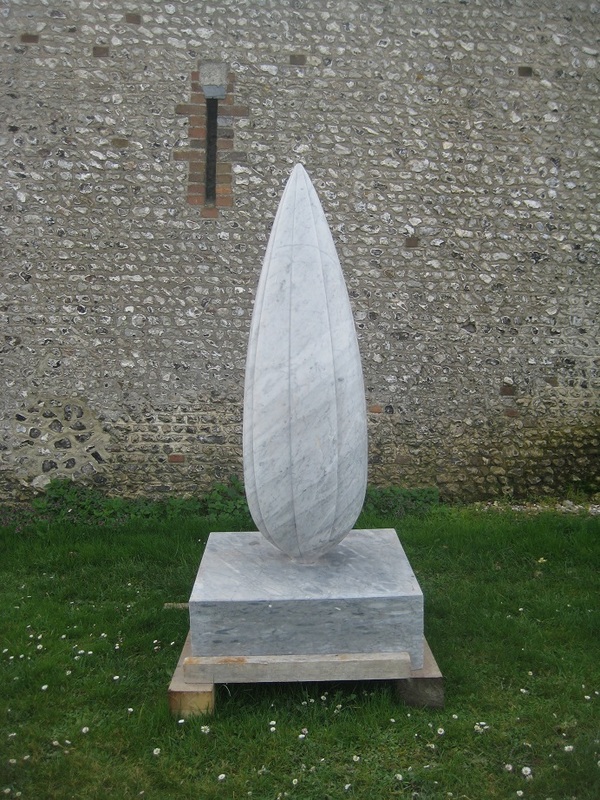 It’s on a memorial just outside the churchyard, which marks a sad wartime event – a Spitfire was being delivered to RAF Tangmere, near Chichester, but crashed near the village. From there it was a short walk back to the car, a chance to sit and have a warm cup of coffee – or two – before we headed home. Finally, the trail trackable comes home! 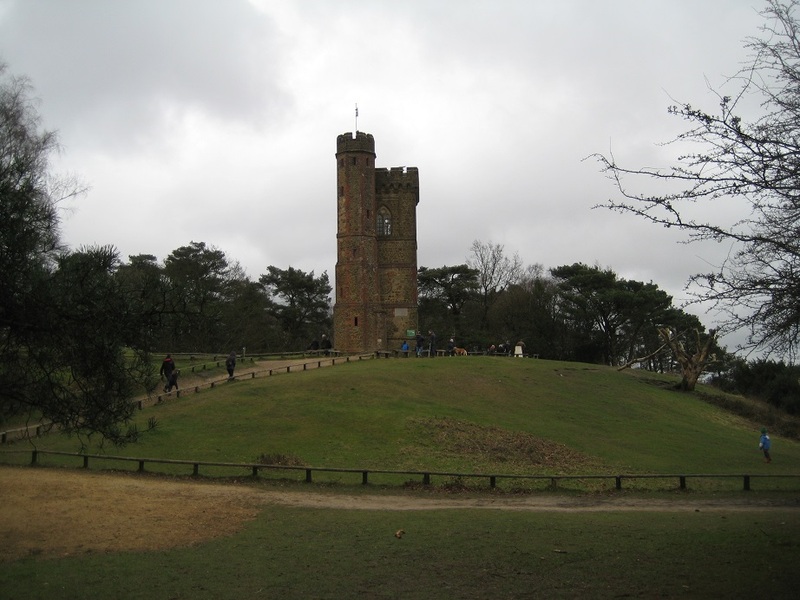 We dipped the trail trackable in our own cache, Berry Bank cache, as we left home, and the trackable came with us as we left Sandhurst (Berkshire) on a cold January day in 2017, and on past Guildford, through the Surrey Hills to Leith Hill tower. 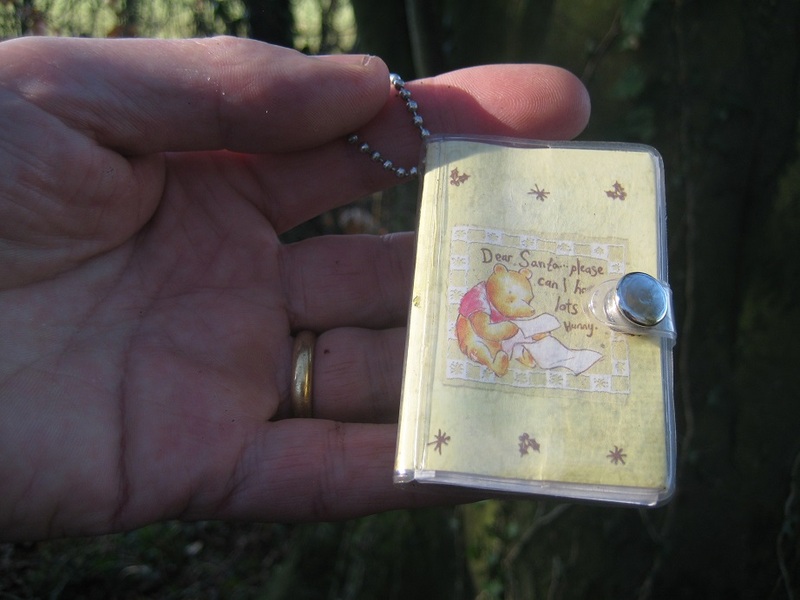 Down into the Weald, we skirted Gatwick Airport and moved on to Ashdown Forest, home of Winnie the Pooh. Turning south near Tunbridge Wells, we paused to look at the Flying Scotsman as it steamed by, then carried on through the Sussex countryside as spring progressed, and crossed into Kent, just north of Bodiam Castle, to arrive at Sandhurst (Kent) in late May 2017. Forward in time to early April 2018, and we were now on the soggy banks of the River Severn at Sandhurst (Gloucestershire). 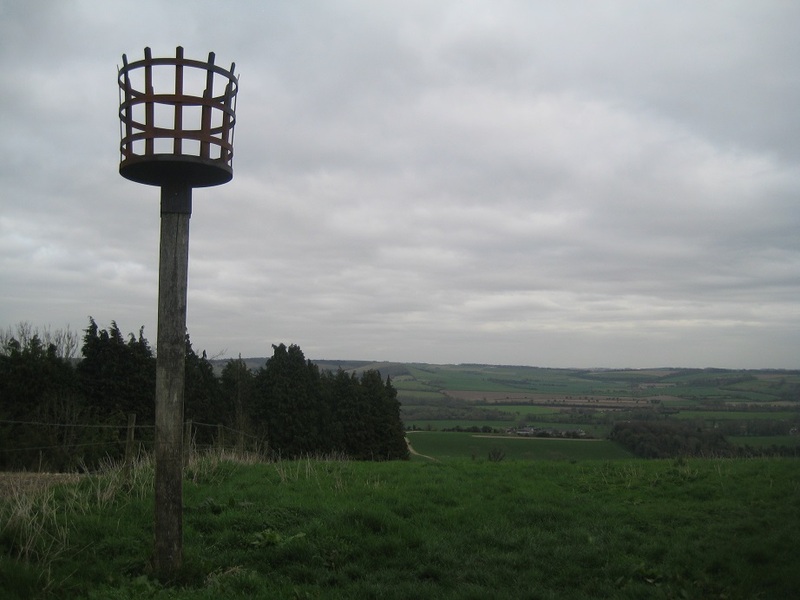 We made our way between Gloucester and Cheltenham, over the M5, then climbed up the scarp slope of the Cotswolds to arrive at Crickley Hill. 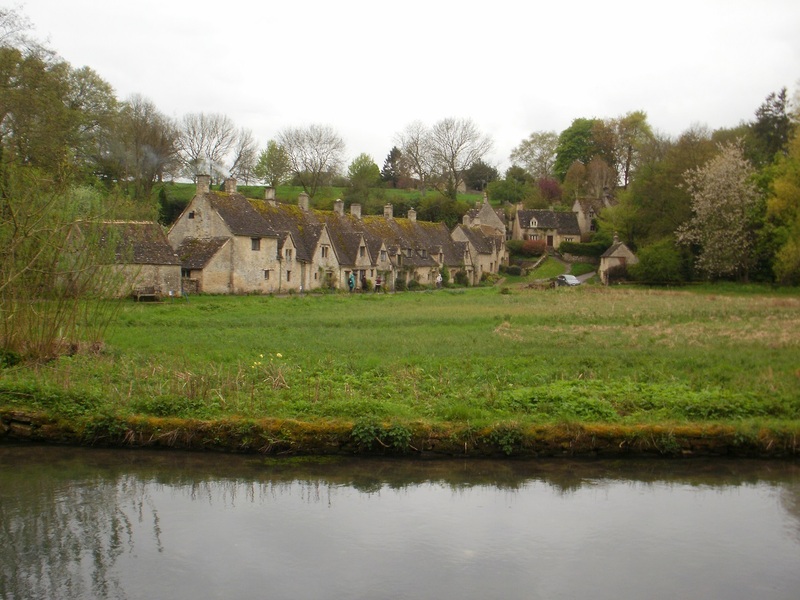 Crossing the busy A419, we continued through the hills, passing through Chedworth, then down the Coln valley to Bibury. Crossing the River Thames near Lechlade, we continued into Oxfordshire, across the Vale of the White Horse, and up to and over the Ridgeway during the hottest part of a very warm summer. 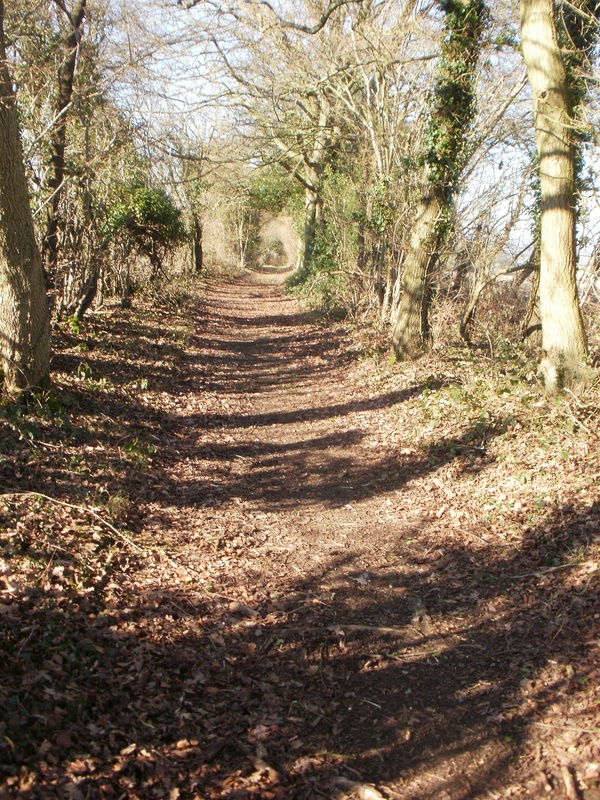 On the Berkshire side of the Ridgeway, the route carried on down the Lambourn valley as autumn approached, then crossed the Kennet and Avon canal and headed across country to the Roman city of Silchester. 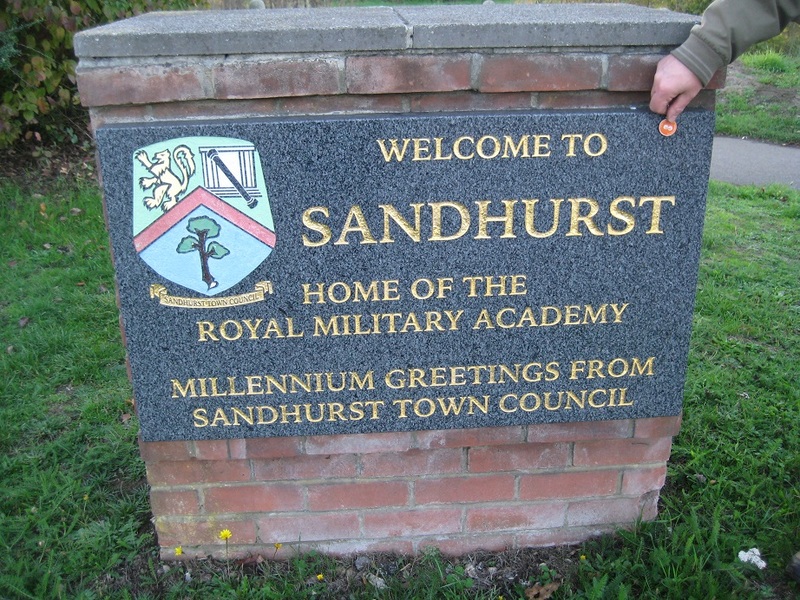 From there, the remainder of the route followed the River Blackwater back home to Sandhurst (Berkshire) in early November 2018. To complete the route, we dipped the travel trackable at Berry bank cache again, and walked the last short distance to home. Job done! That’s 180 miles across almost the whole of southern England, a great variety of landscape, agriculture, people and wildlife, but just one large town, Newbury. It’s time for the trackable (and us!) to have a rest now!